It’s already time to go back inside (and outside!) 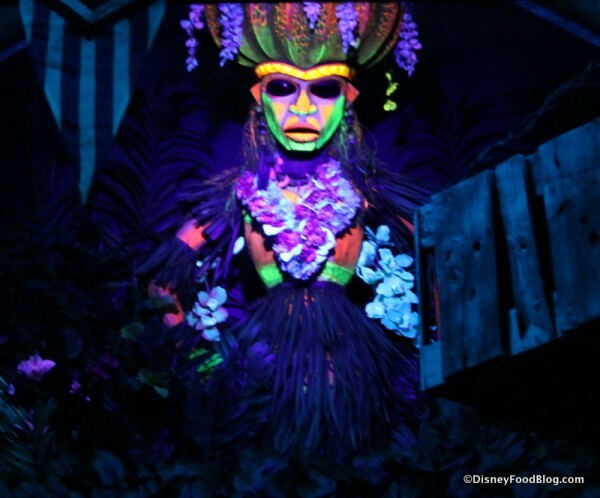 Trader Sam’s Grog Grotto and Tiki Terrace at Disney’s Polynesian Village Resort! 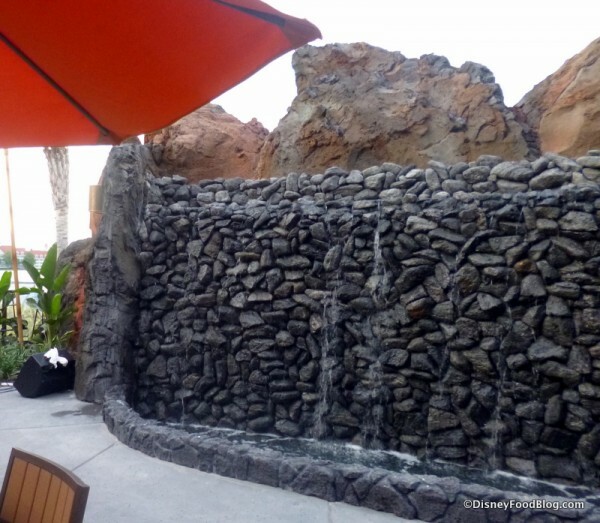 While both the Grotto and Terrace continue in soft openings with an official opening anticipated for late April (when all the sought-after souvenir glasses will be available for guests to take home), these new hot spots remain the talk of the town. How long until you can get past Trader Sam’s door? Unsure of what to expect, my husband and I arrived at the Polynesian at 2 pm on a weekday for the 4 pm opening, and no line had started yet (though the bar is open until midnight, after 8 pm only guests 21 and older are permitted). 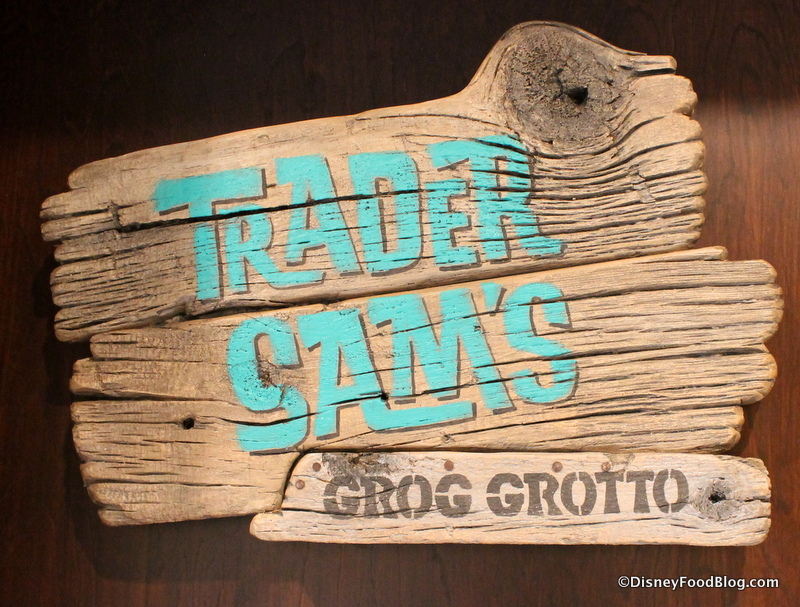 At 3 pm, we decided we’d better stake out our spot, so we went to the inside door of the Grog Grotto, where two Cast Members were waiting. 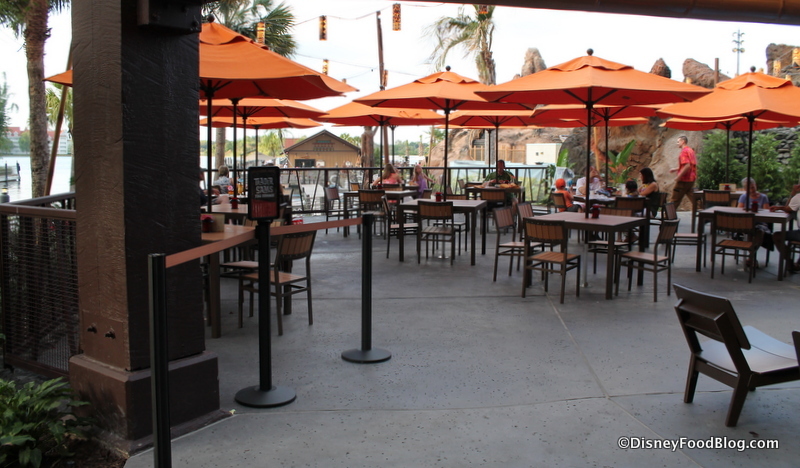 We were told we were the first for the day, and could start the line outside at the metal bench pictured below. The next guest arrived at 3:15, and a line in earnest began to form at 3:30 pm. Around 3:50, a Cast Member came outside and gave us all a stamp to show at the door as our proof that we’d been counted in the line. At this time, I counted around 40 people waiting, and when we were let in at 4:00 pm, everyone made it inside to fill up the 51 person capacity. Huzzah! Now, I’m not claiming this will be the case everyday. We clearly arrived early anticipating a wait and were shocked that there wasn’t one, especially during what’s considered a peak time (still in the Spring Break window). Now, I had a friend in town Saturday of the same week. 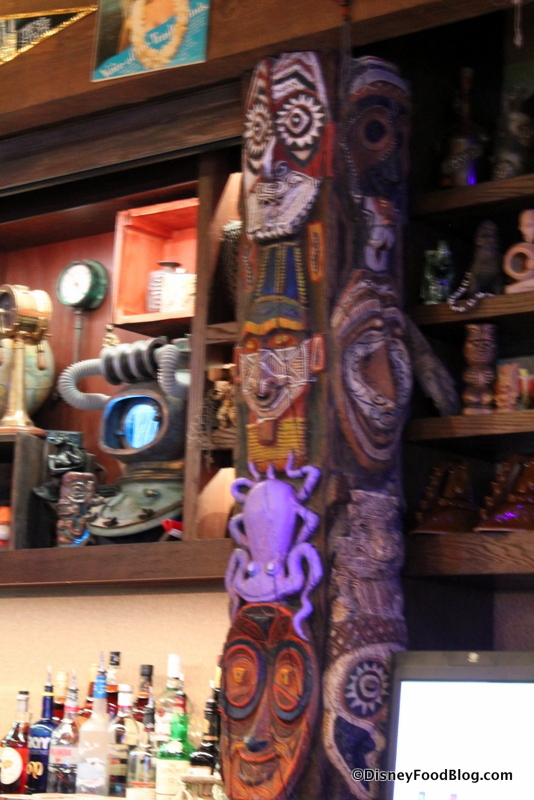 She arrived at Trader Sam’s at 7:30 pm and was given a pager for a 90 minute wait, and folks arriving a while after were looking at a couple hours at least. That’s not altogether surprising, though, since I think we can all anticipate longer lines on weekends for what is sure to be a popular destination for locals as well as vacationers for a long time to come. You’ve now entered Trader Sam’s “happy hideaway.” The story of the Grotto is told to us by Skip, Manager of the Jungle Cruise Navigational Company (just click the image below to enlarge). As head salesman of the jungle that we all know and love from the Jungle Cruise, Trader Sam discovered a passion for mixology as an extension of his professional interest in head-shrinking potions. 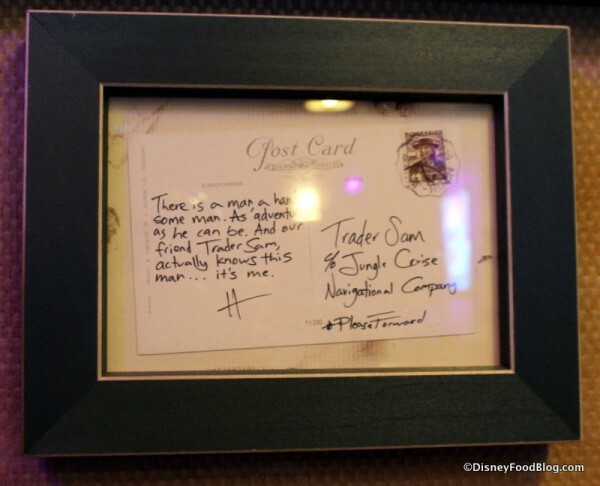 As he traveled the globe for ingredients, he picked up many a souvenir and brought them back to the Grotto. Entering the Grotto for the first time was — for me, at least — overwhelming in the best way possible. 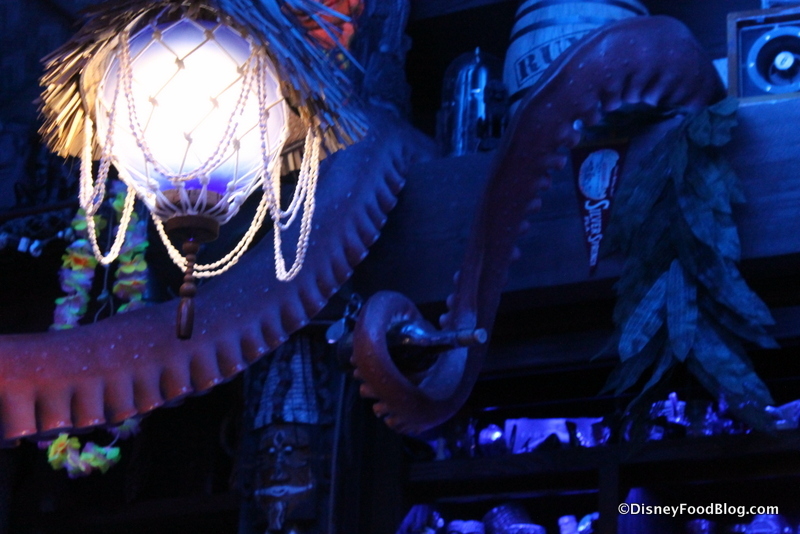 While you want to grab a table or a seat at the bar (and lemme tell ya, it’s best to move quickly to get one), it’s difficult to not want to try to take in every bit of the INSANE amount of details and decoration right away. This room is simply the stuff of dreams for fans of Disney detail and history. Before we take in a few of those gems, the basic setup is small and…well, I don’t know if “cozy” is the word. It’s snug, for sure, but somehow not in a bad way. The way everyone is close together, it seems to encourage a party atmosphere and festive mood. Oh, my… where to start? 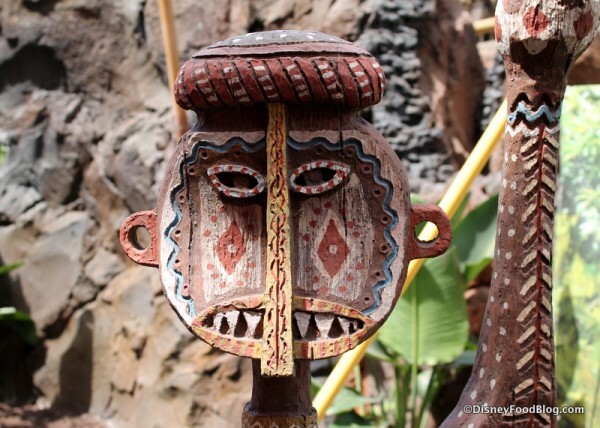 Well, I’ll take a cue from a Jungle Cruise Skipper and point out a few of my favorite details! There’s this one. schtick-y stuff crammed into every nook, and you could visit this spot dozens of times and catch something new every time. Nautical elements are part of the theme as well, and fans of 20,000 Leagues Under the Sea will find many reasons to enjoy peeking around. 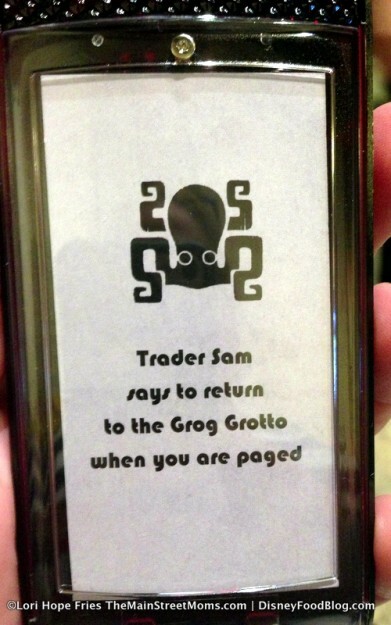 Although I have to wonder if Sam really meant to bring this guy back from his travels. 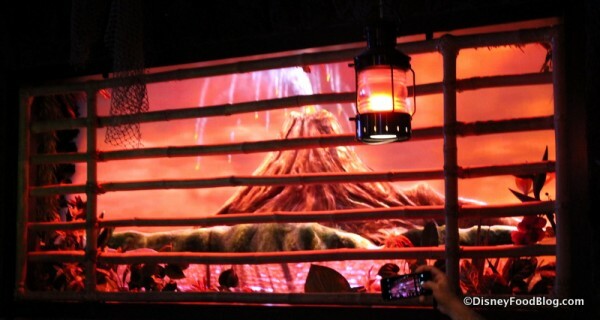 … into a fierce eruption! 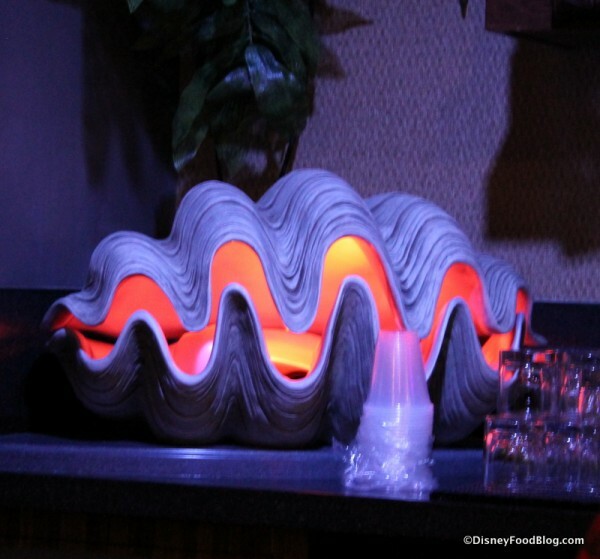 If a Polynesian Pearl is what you’re after, your bartender has to grab one from this glowing clamshell. 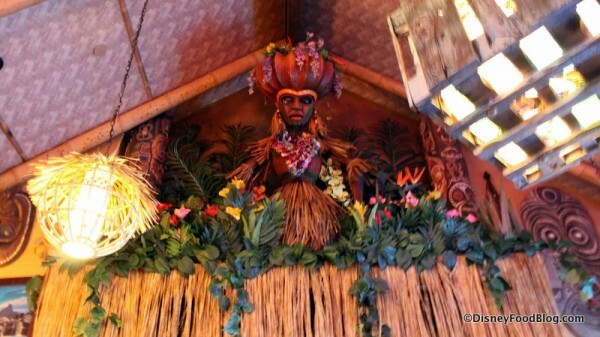 Oh, sure, it’s all fun and games in the Grotto… until somebody orders an Uh-Oa! Cast Members lead the chant (“Uh-Oa! Uh-Oa! 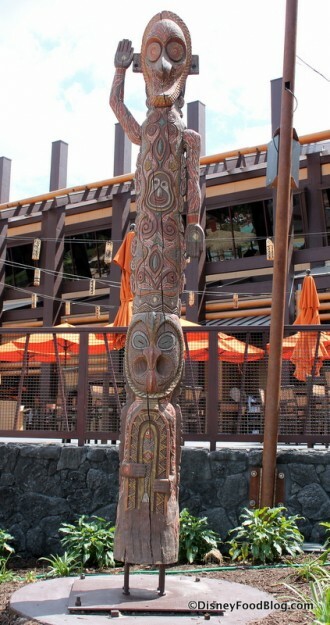 Uh-Oa!”) alerting the Tiki goddess of Disaster. You’re soon to find out, this makes her plenty mad. Don’t say we didn’t warn ya! For more of the ordering antics, check out our First Look from opening day of the Grotto! 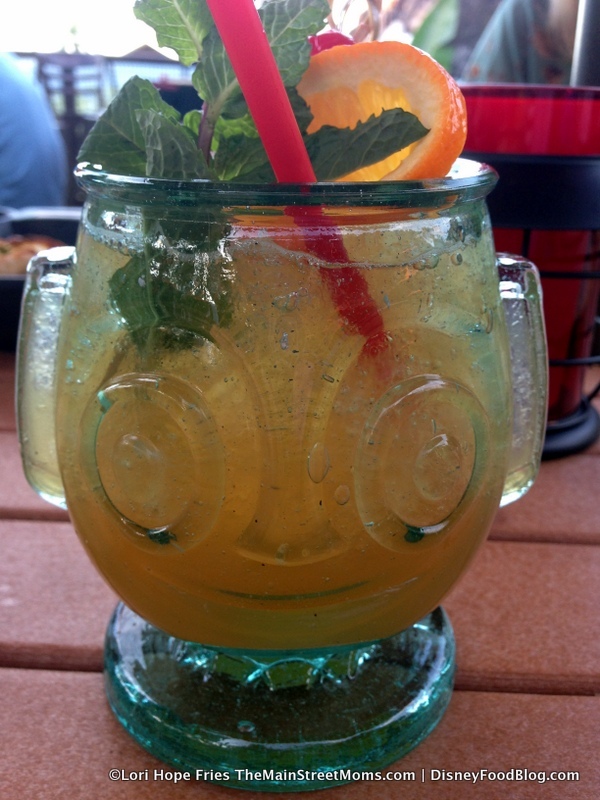 Well, we’ve started talking about drinks, so I guess that means it’s time we get to sippin’, Skipper! 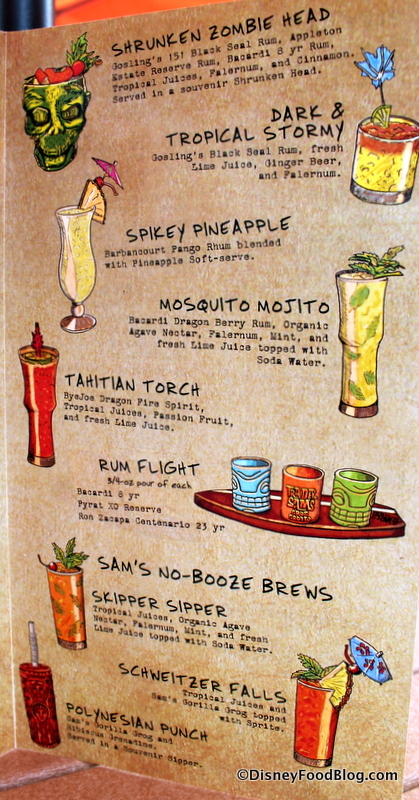 The primary focus of the menu is a fun selection of Sam’s famous libations. Reading all the puns, jokes, and nods to Disney lore is as much fun as naming your poison, so I’m including pics of the full menu here. 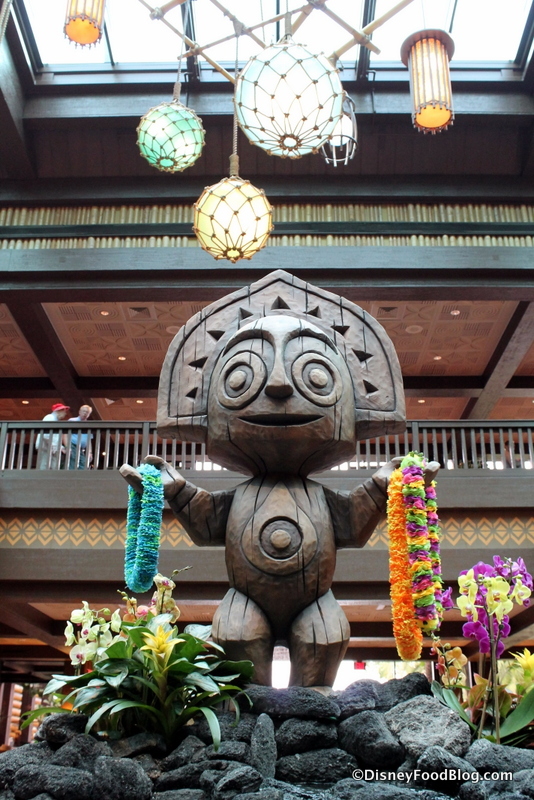 While some drinks have made the trip over along with Sam from his Enchanted Tiki Bar in Disneyland, the Polynesian Pearl is a Disney World exclusive. You can also get an idea for which drinks come in a souvenir glass from the menu drawings (again, please note, not all souvenir glasses are available to take home during the soft open period). Also unique to Disney World is the Tahitian Torch, while the Mosquito Mojito comes to us from Disneyland. The Dark & Tropical Stormy is also new, pictured here beside the Tiki Tiki Tiki Tiki Tiki Rum. 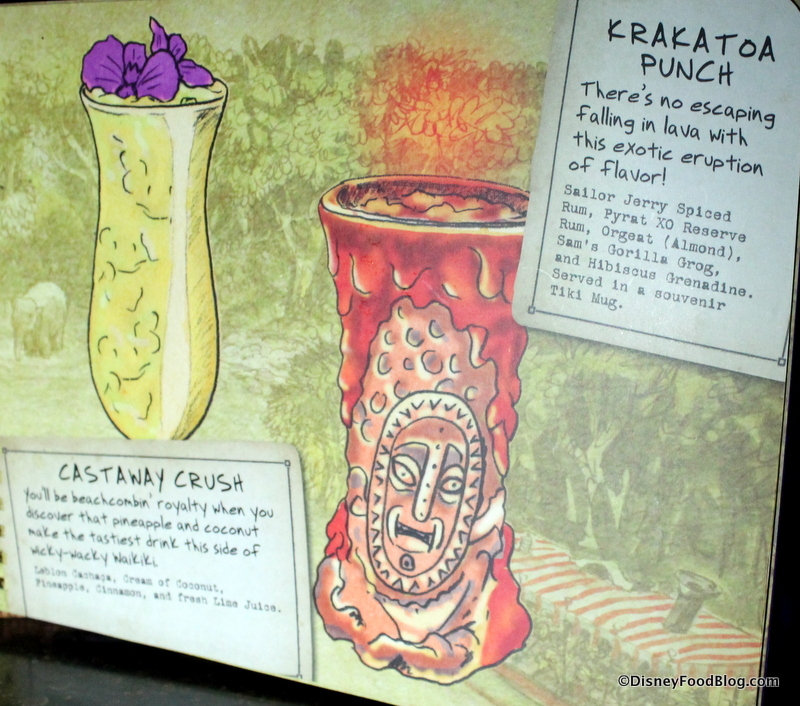 The Krakatoa Punch is a west coast native (souvenir glass pictured), while the Castaway Crush is an east coast baby. Aaah, the much-discussed Nautilus… this souvenir bowl filled with all sortsa high-end spirits will be available as a take-home souvenir after the official opening for a tab of $52. The HippopotoMai-Tai is already a huge hit (“Two Shots of Rum!”), and Rosita’s Margarita joins the ranks, too. 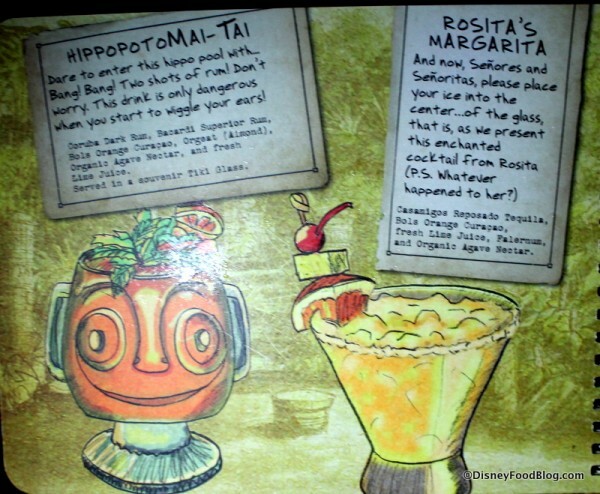 While both drinks hail from Disneyland, the HippopotoMai-Tai souvenir glass at Disney World looks more like the new Tiki statue that greets guests in the Polynesian Resort lobby. 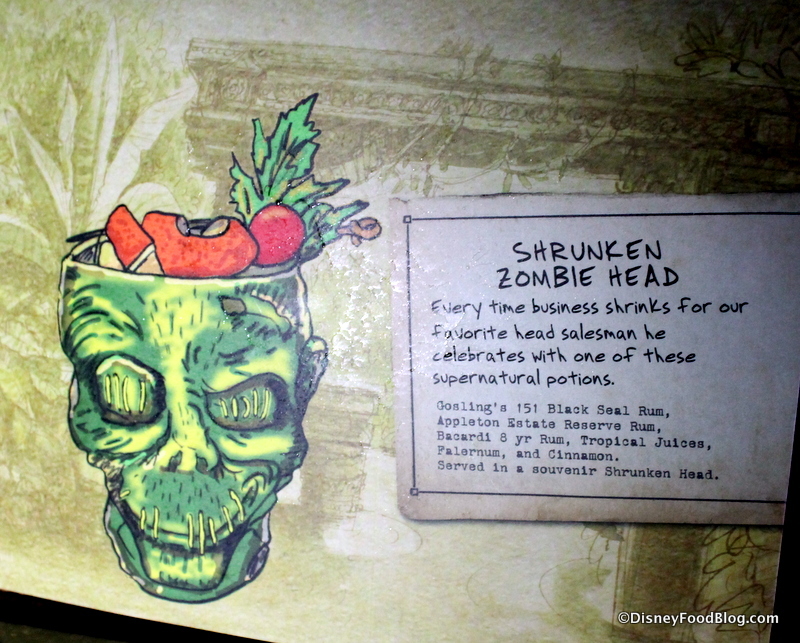 The Shrunken Zombie Head and Uh-Oa! 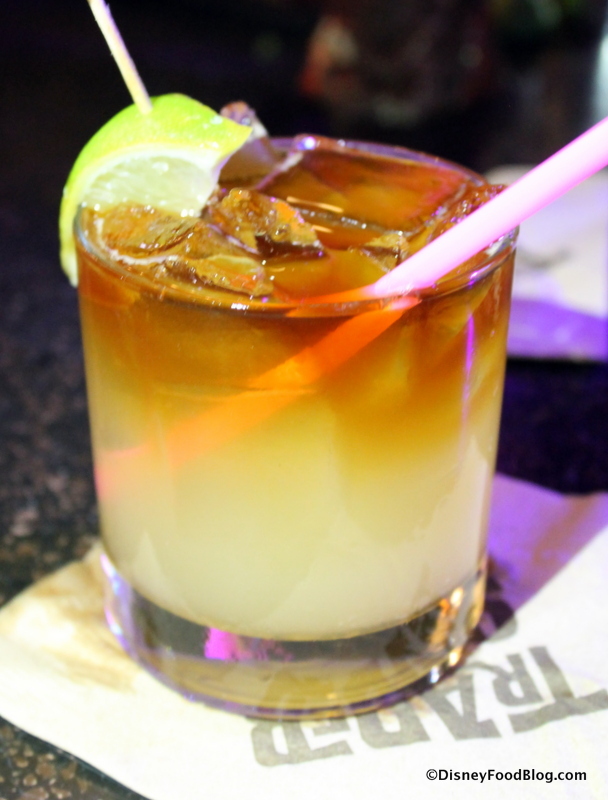 round out the list of specialty cocktails. 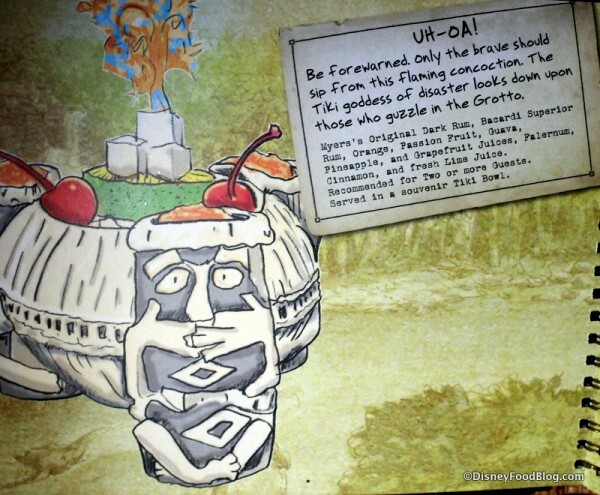 The Uh-Oa! 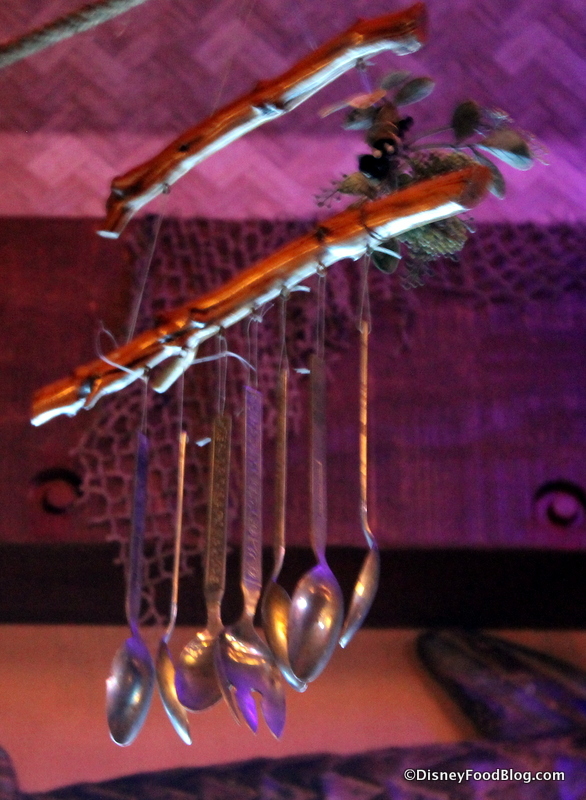 comes with little pots of cinnamon on the actual cup that you can use to make sparks in the flaming drink as it’s brought to your table. 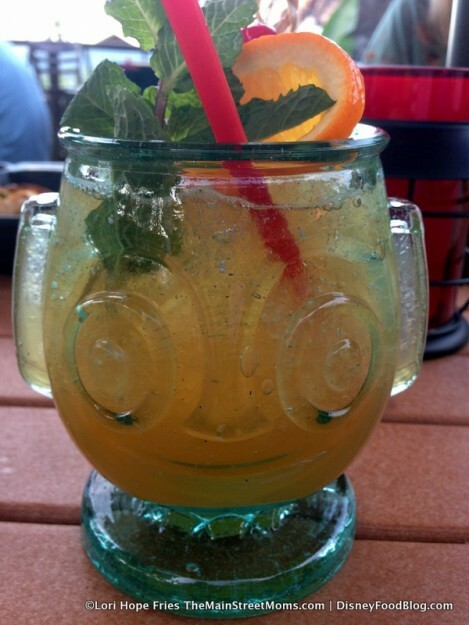 Note that there are holes in the cup for four straws for sharing. 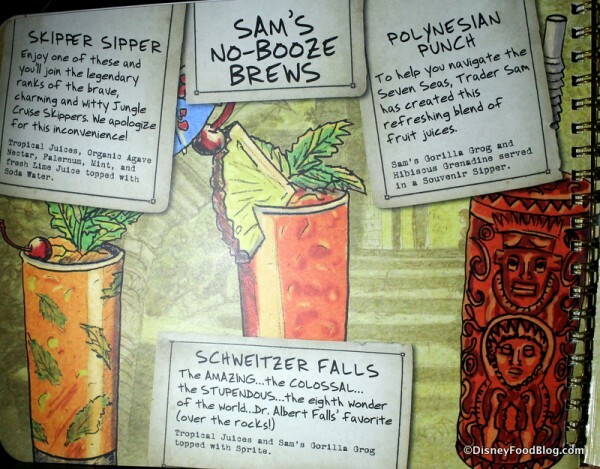 Sam’s No-Booze Brews offer non-alcoholic concoctions such as the Skipper Sipper, Polynesian Punch, and Schweitzer Falls. If you’re not into Sam’s mixology, have a look at the beer, wine, and flights. Though you won’t see the Kungaloosh (well known to fans of Disney World’s former Adventurers Club) on the menu at Disneyland’s Enchanted Tiki Bar, you can order one there (new or old version). However, it’s not available at Disney World. 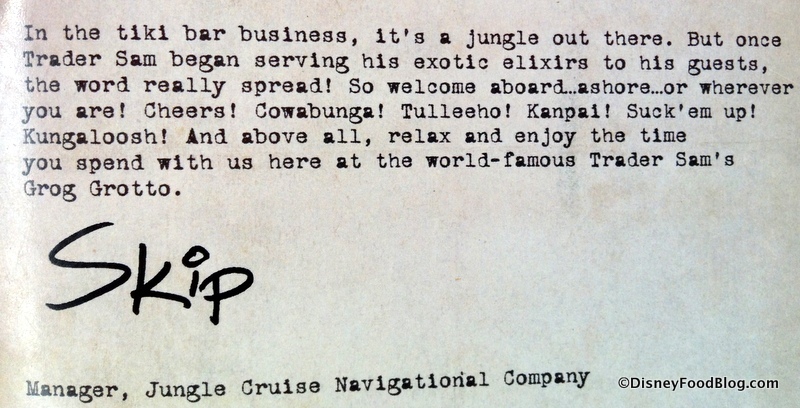 According to one of the bartenders, Trader Sam is “out searching for an authentic Kungaloosh;” so let’s hold on to hope, Adventurers! Food is available inside the Grotto, too. 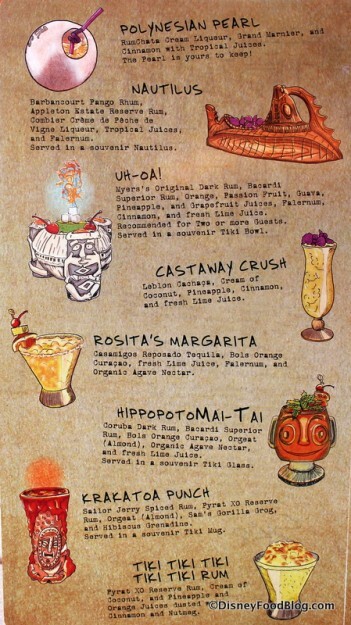 We’ll be delving more into this topic outside at the Tiki Terrace, but here is a peek at the offerings. 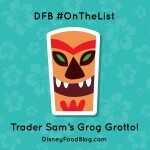 We couldn’t resist trying a few of the brews that Sam mixed up just for the Grog Grotto, so we started with the Dark & Tropical Stormy: Gosling’s Black Seal Rum, fresh lime juice, Ginger Beer, and Falernum. This first picture is a pan out, because as with every drink here, you’ve gotta check out the straw. Notice the windblown umbrella, too! Okay, so now here’s one of the actual beverage 😉 . 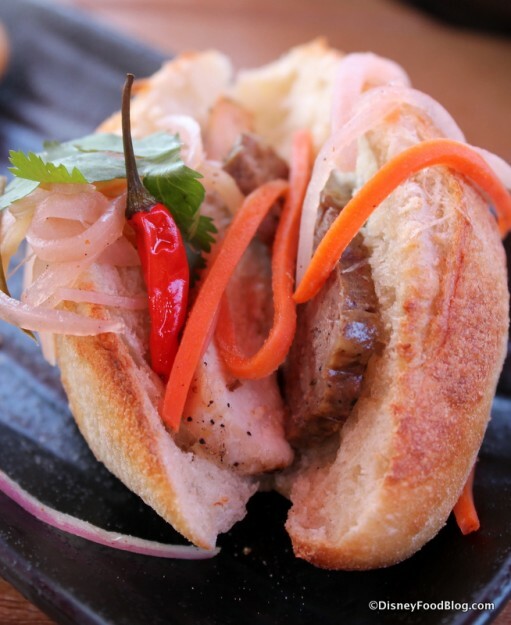 And you’ll want to remember this one, because it’s delicious. I wasn’t sure what to expect, since ginger can be so overwhelming. But even as the dominant flavor it ended up great, making this drink both sweet and spicy. 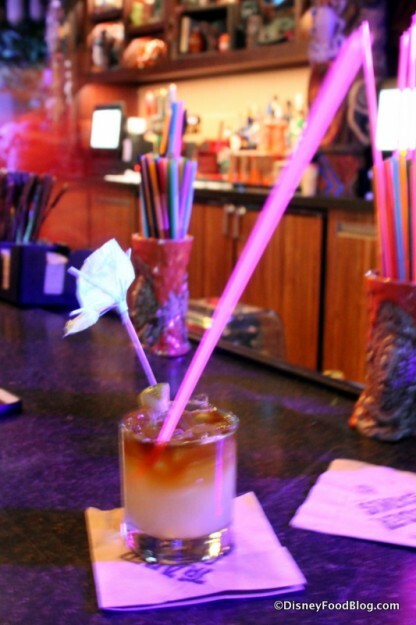 You can see from the picture that it’s poured in layers, so you experience different flavors with each sip if you don’t mix it with your gigantic straw. The straight pour of rum lent a nice strength to this one as well. 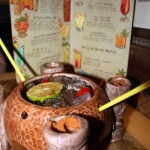 By the way, since the drink prices aren’t listed on the menu, the Dark & Tropical Stormy rang up at $8.00. 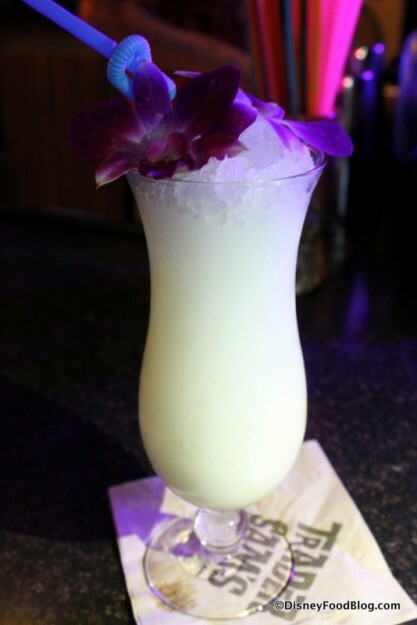 The Castaway Crush is Leblon Cachaca, Cream of Coconut, pineapple, cinnamon, and fresh lime juice ($10.25). The flower topper is just gorgeous. 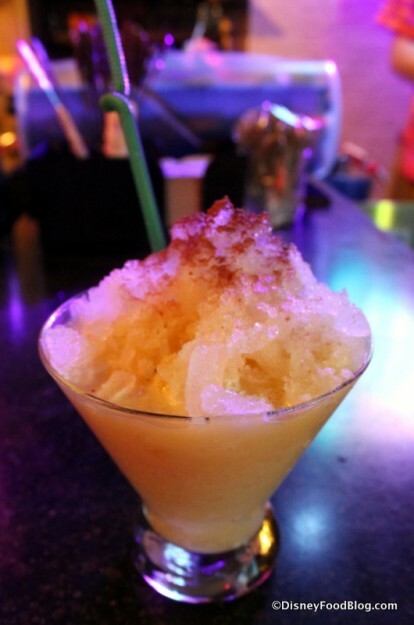 The cream of coconut was right up my alley, though I really didn’t pick up on the cinnamon. 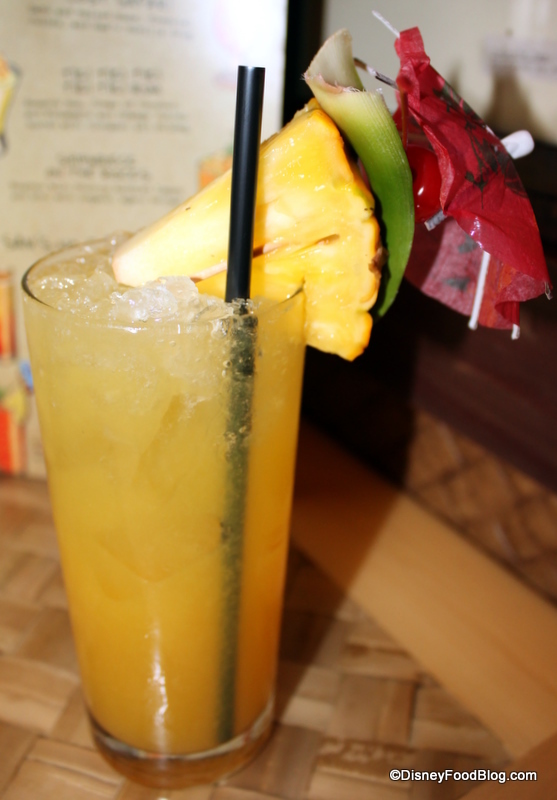 It was primarily the coconut and pineapple that came together for a classic tropical vacation drink. The cinnamon was more prominent in our next beverage. This time we went with one you can also get at Disneyland: the Tiki Tiki Tiki Tiki Tiki Rum ($11.50). The ingredients definitely have appeal (this time it’s Pyrat XO Reserve Rum mixed with Cream of Coconut, OJ and pineapple juice, all dusted with cinnamon and nutmeg), but I’ll admit it: I’m a sucker for the name, and a sentimental Adventureland-lovin’ fool. 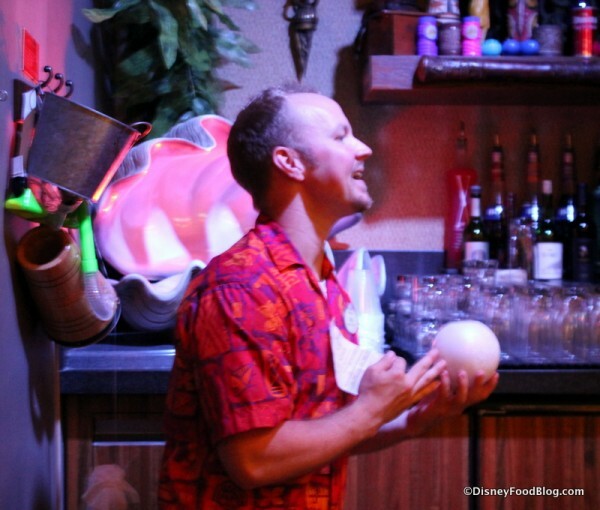 Again, the cream of coconut made this milky drink go down smooth… and quickly! The spices and base together reminded me a little of the Horchata Margarita at La Cava del Tequila sans tequila (though the Polynesian Pearl, made with Rumchata, likely has a closer resemblance). The juices here were not as prominent to me. 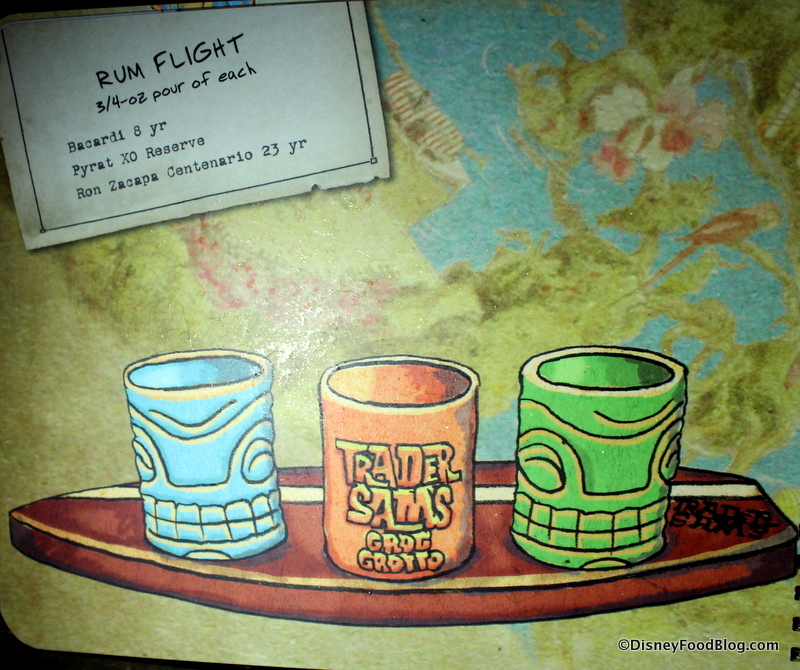 While all three drinks were really enjoyable, the Dark & Tropical Stormy ended up as the strong favorite, not only because of the unique flavor and strength of the drink, but also because it seemed to offer the most bang for the buck, as the ice-based Castaway Crush and Tiki Tiki Tiki Tiki Tiki Rum were almost over before they began due to the amount of ice in the beverages. We grabbed one more before exiting; this time, a No-Booze Brew, the Skipper Sipper. 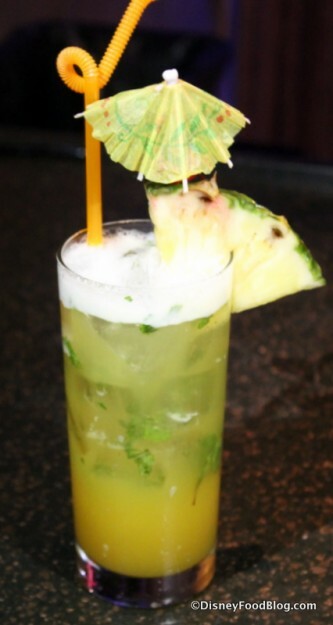 It’s a mix of tropical juices and agave nectar, falerum, mint, and fresh lime juice topped with soda water ($4.79). This was quite awesome! 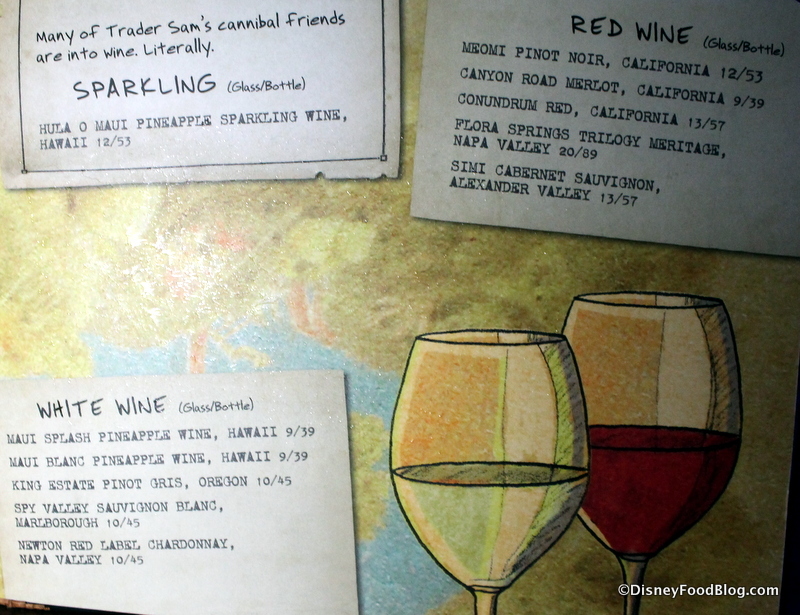 I was really surprised at how well the tropical juices and lime were complemented by the mint, and the flavors were strong. 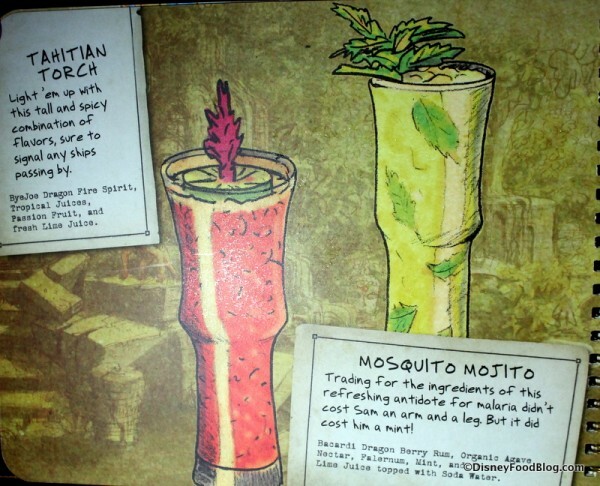 I think it’s great that the non-alcoholic drinks appear to have been given as much thought and creativity as the alcoholic cocktails. I would get this again in a heartbeat (even though the best name for a No-Booze Brew still belongs to the Schweitzer Falls). 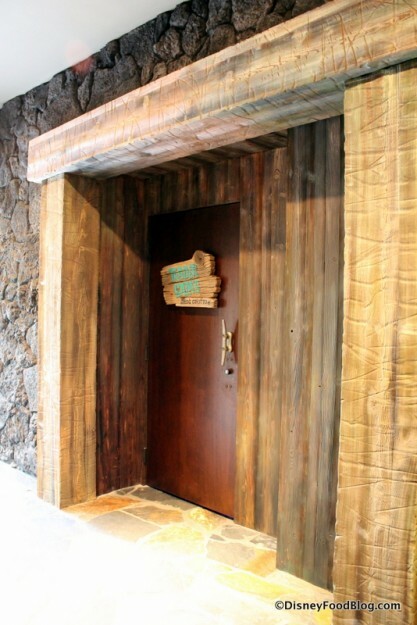 Altogether refreshed and entertained, it was time to leave the Grotto. 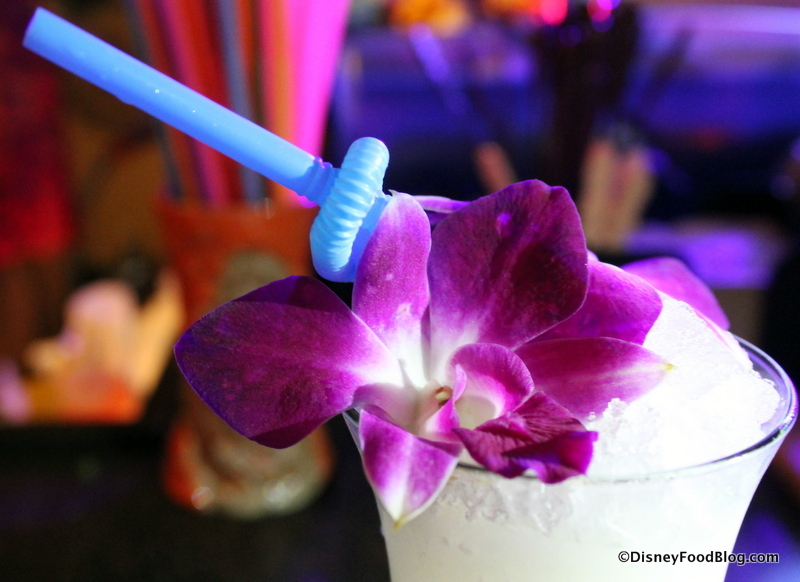 Great drinks, an awesome cast, and a truly unique setting filled with a million nods for Disney fans all come together to create an immersive and memorable experience. I can’t wait to go back, and even if there’s a line next time, I won’t mind much at all. And now… Welcome to Trader Sam’s outdoor haven, the Tiki Terrace! 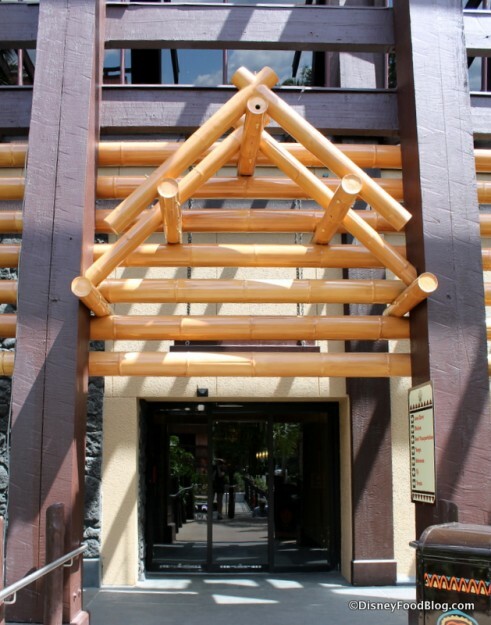 We strolled outside after exiting the Grotto, and there was no line. It was just a casual walk to the table of our choice. We decided to grab food here since the lighting would be better for pictures. 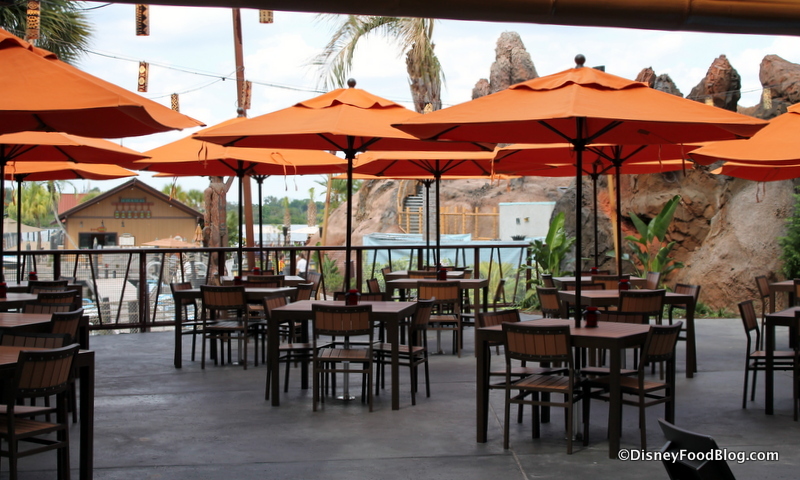 Unlike inside, there is lots of seating available at the Tiki Terrace (it has a capacity for 80 as opposed to the Grotto’s 50). Umbrella-topped tables dominate the scene, but a few folks will enjoy the small surfboard tables. 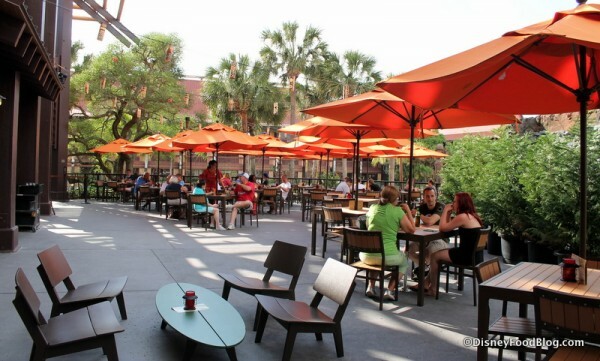 The terrace itself is surrounded by — what else? — tikis! 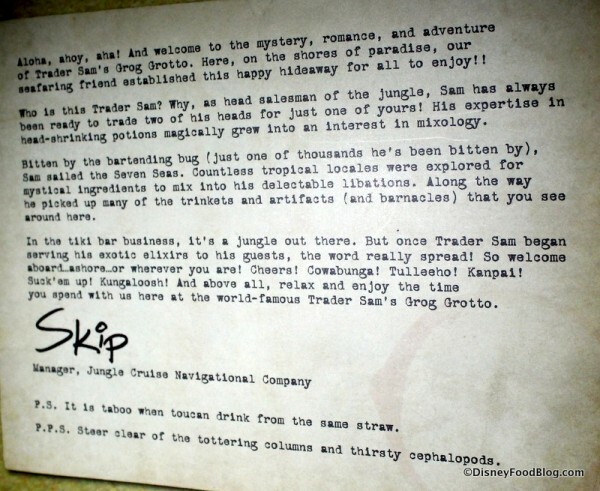 Servers — I mean, Skippers! — come to your table, but they bring your brews from the bar in back. 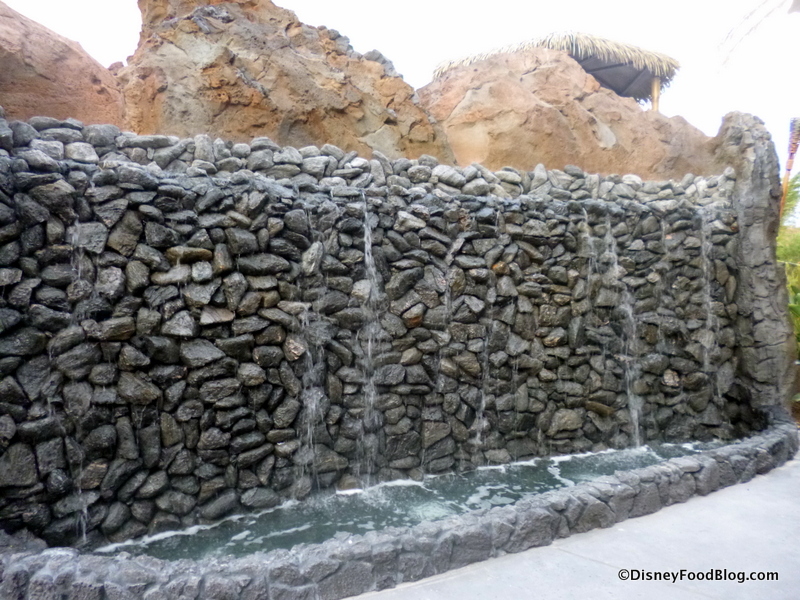 A waterfall completes the relaxed vibe. Aside from the physical setting, a huge part of the atmosphere is the music of the islands. 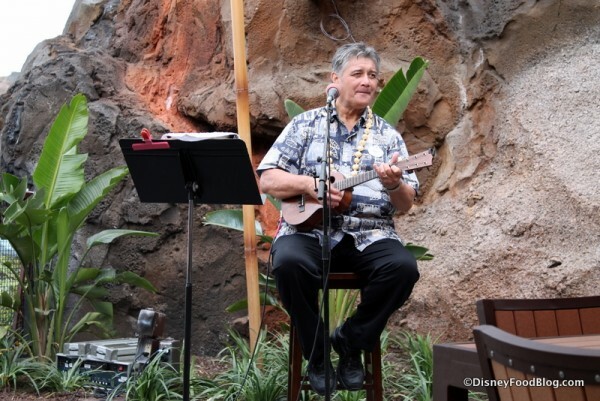 The live music is a wonderful touch, and really lends to that “I’m at the Poly” feel. Music still plays a part even when the musician is on a break. Surfing sounds and Hawaiian tunes pipe through the air. 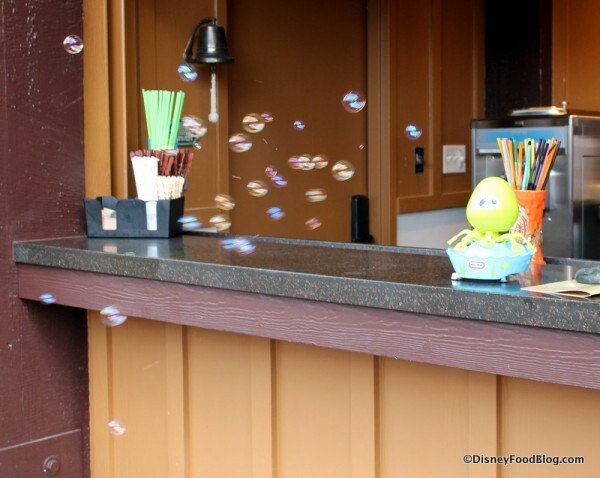 And when “Tiny Bubbles” comes on, keep an eye out for a Skipper sharing his own supply of tiny bubbles! 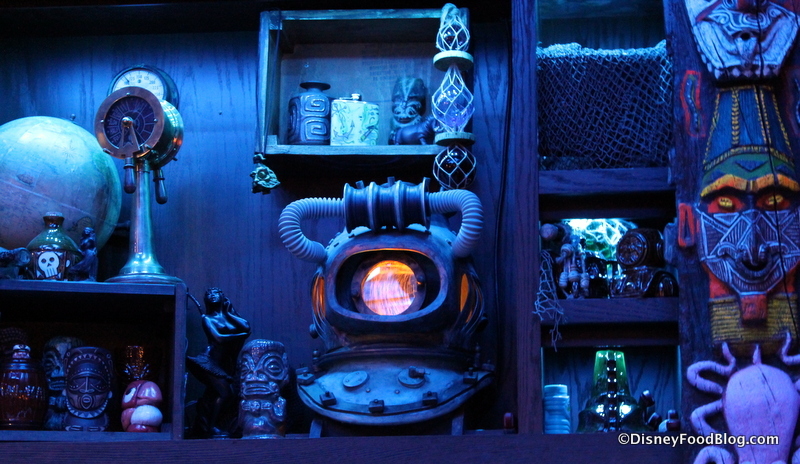 Speaking of the Skippers… the Cast inside the Grog Grotto gets a lot of attention, as well they should. They are a huge part of the fun, and it wouldn’t be what it is without them. 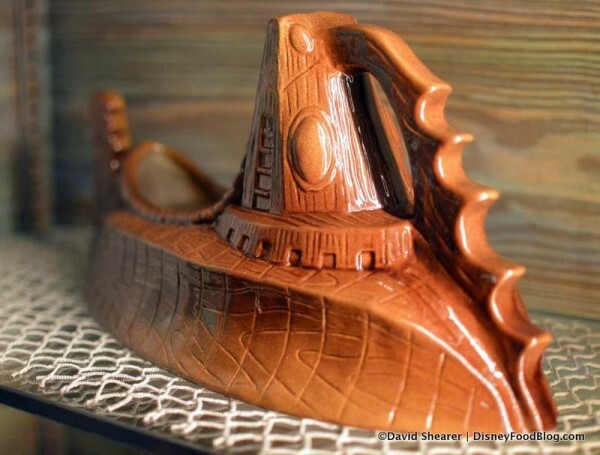 In their own way, though, the outdoor Skippers are just as great, providing a really welcoming, fun, and warm setting for guests and offering great service at the same time. I can’t say enough good things about them. In general, though, it’s all VERY relaxed in sharp contrast to what’s going on indoors. Where the Grog Grotto is wacky, zany, and loud, the Tiki Terrace is as chill as it gets, and I love that both atmospheres are available to experience. 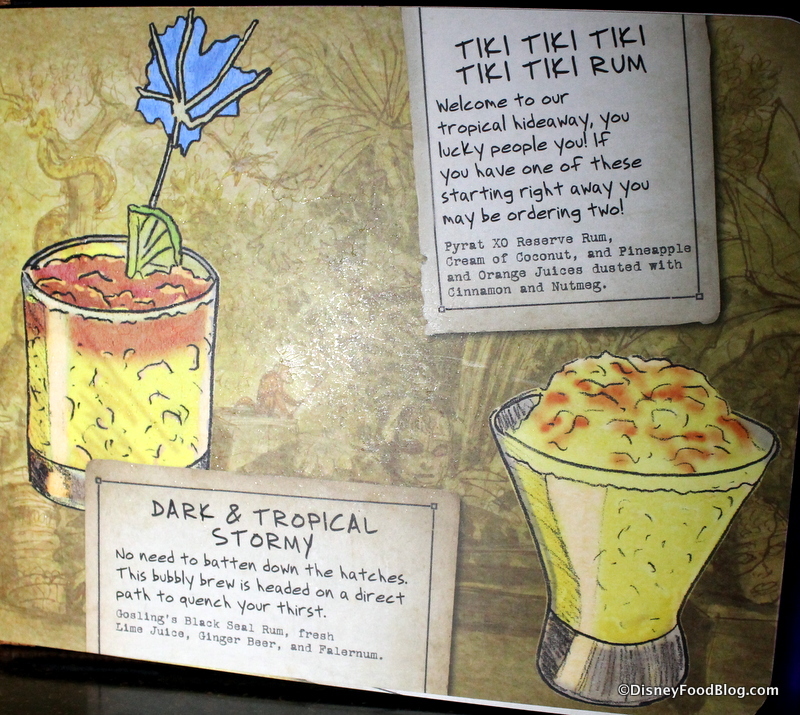 The menu at the Tiki Terrace matches the Grotto’s menu with one incredibly cool exception. 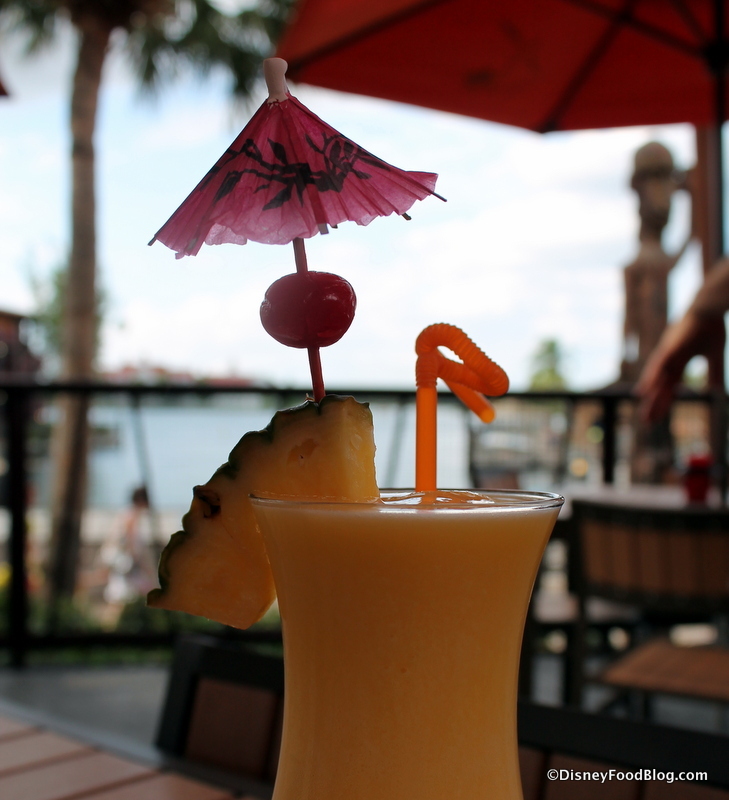 While most of the hubbub has surrounded the Grotto, the Tiki Terrace has some bragging rights all its own, and among them is this: the Spikey Pineapple. 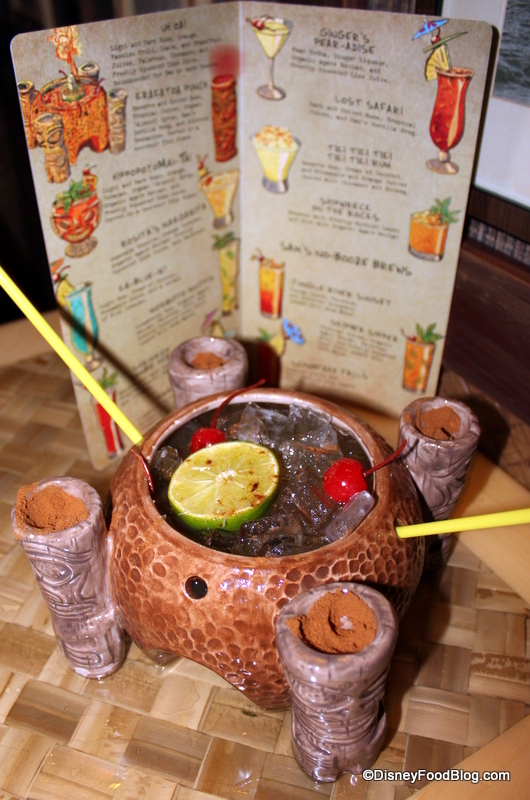 You can’t get this drink inside the Grog Grotto — it’s only outside at the Tiki Terrace. 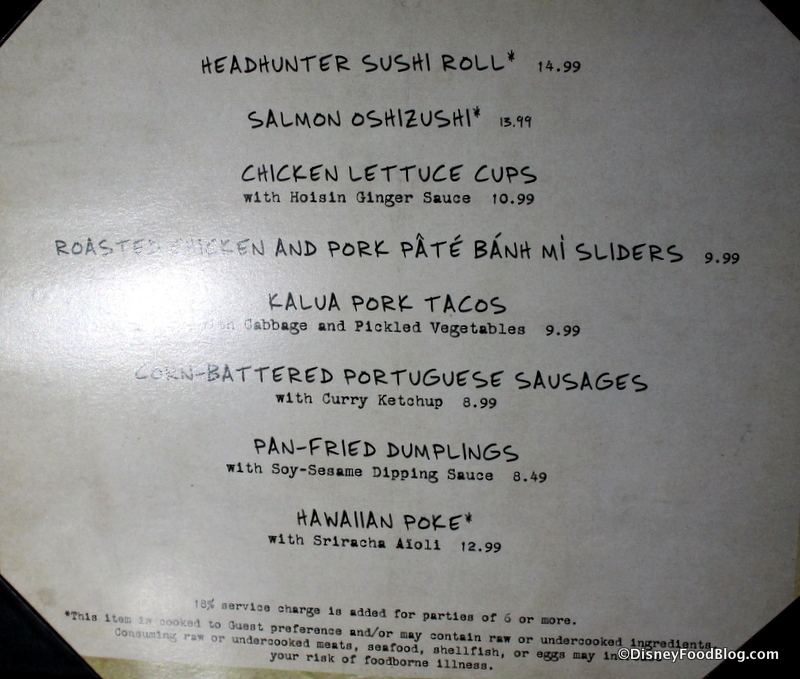 Though we already looked at the menu pages, I’m going to give this one its own closeup. You read that correctly. 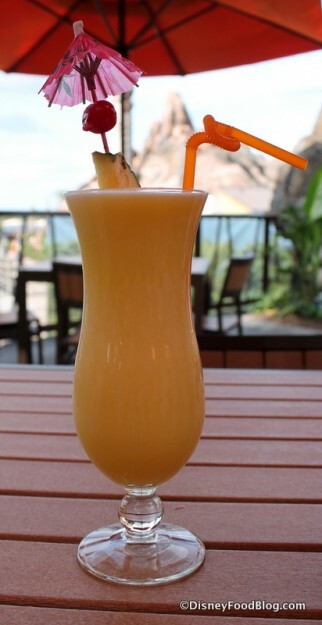 The Spikey Pineapple is rum blended with Pineapple Soft-serve. That’s Dole Whip, my friends! And the Spikey Pineapple is a huge, cold hurricane glass full of it — in a form meant for sipping! 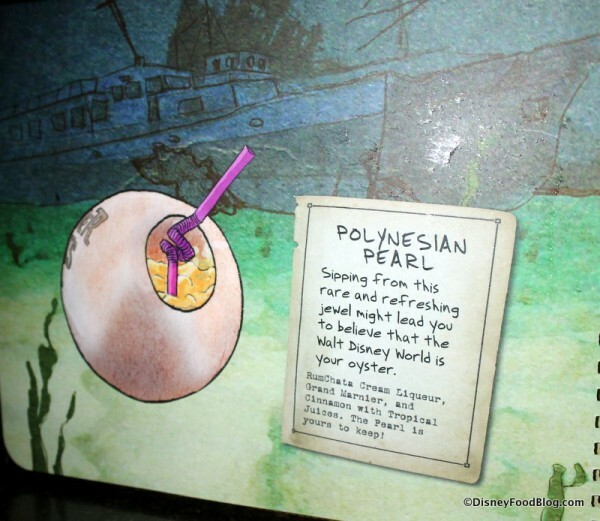 Coming in at $10.25, this is a vacation in a glass: a classic Disney flavor with the soft serve, a hint of rum to add to your vacation pleasure, all topped off with a pineapple wedge, cherry, and an umbrella. 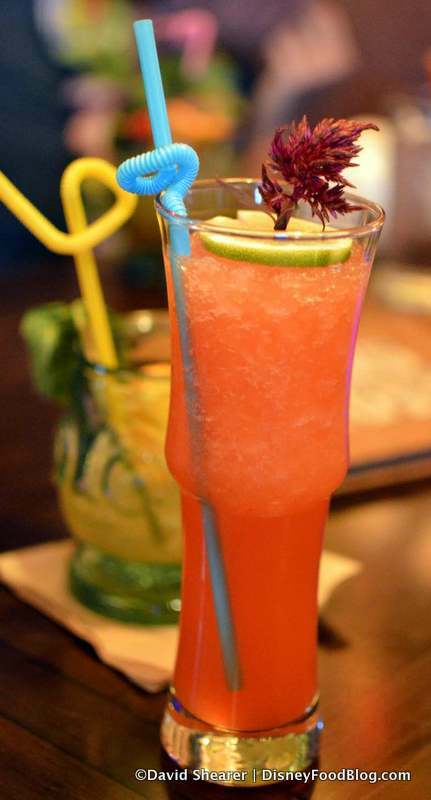 It’s cold and refreshing, yummy and whimsical. 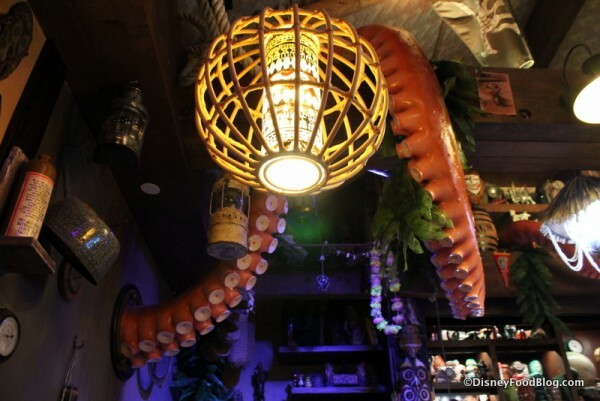 Well done, Tiki Terrace! 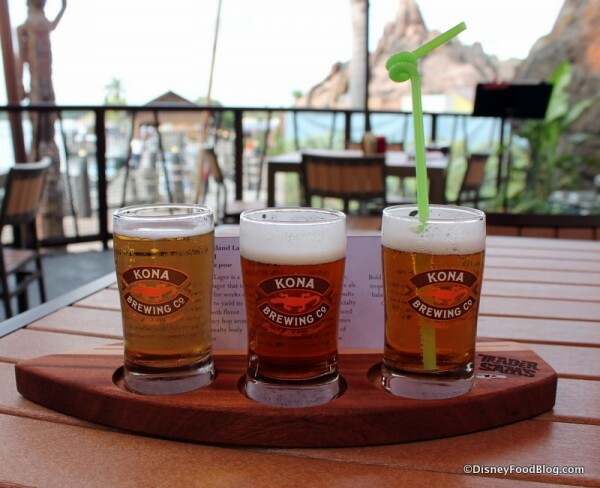 My husband ordered the Kona Beer Flight: Kona Longboard Island Lager, Kona Fire Rock Pale Ale, and Kona Castaway IPA. The souvenir glasses you see were not available to take home yet, but even when they become available after the official opening, you should know that the cool surfboard they’re sitting on stays with Sam. He’s partial to it. Regarding the IPA specifically, my husband noted that the bold, citrusy hops with a touch of tropical mango and passion fruit were balanced by rich caramel malts, resulting in a clean and crisp finish. And he definitely thought the IPA was the standout. He enjoyed the option of the flight, but next time he plans to grab just the IPA. Okay, now… onto the EATS! 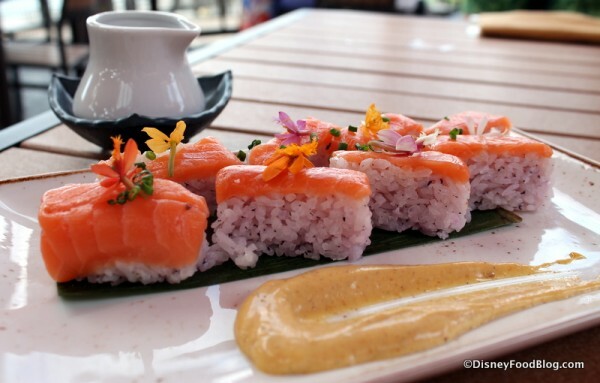 You sure do work up an appetite in the jungle, so we went with four items, starting with the Salmon Oshizushi (pressed sushi). The small white cup pictured above holds the soy sauce, and you also receive a mango curry sauce for spreading. This is what I call a great “starter sushi.” It’s simple and not as intimidating as a roll for a sushi beginner (I still consider myself one). And it was great — fresh and flavorful, especially when you pour a little of the soy sauce on your plate so it soaks into the rice, and topped with some of the mango sauce. 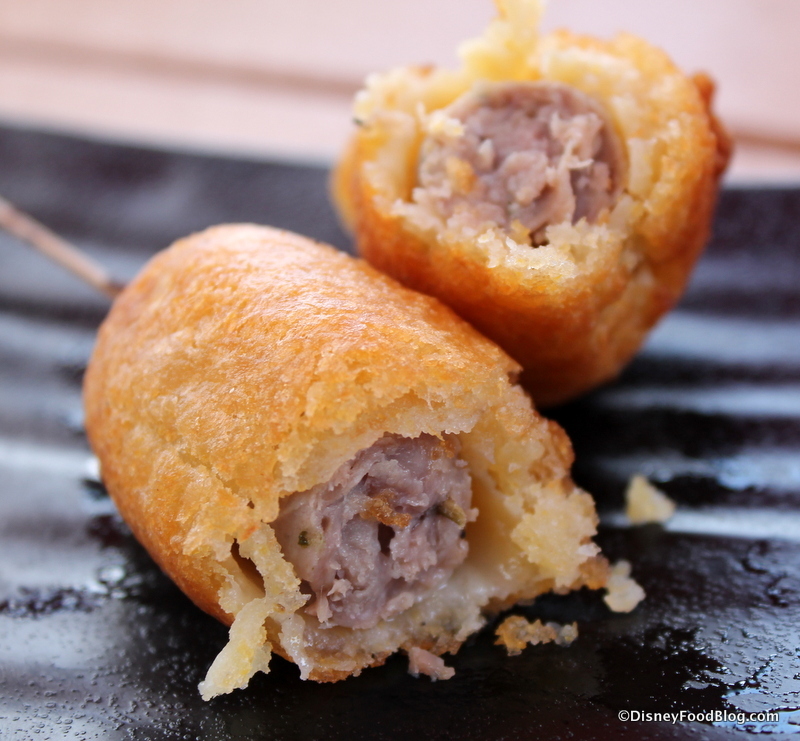 Next up: the Corn-battered Portuguese Sausages. 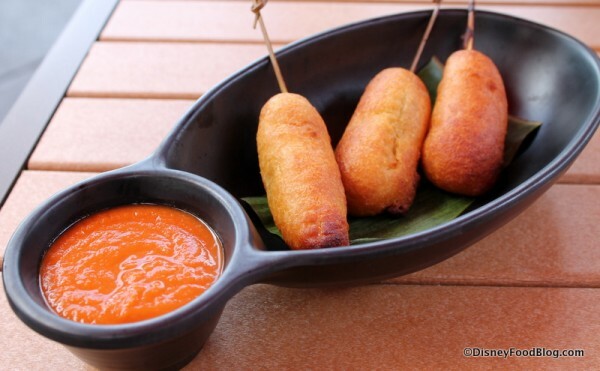 Served with a curry ketchup (with hints of mustard and sriracha), these are exactly what they appear to be: corn dog sausages, complete with sticks! The dipping sauce was a great spicy accompaniment for this tasty fried snack, and it turns out that corn batter goes almost as well with sausages as with hot dogs. 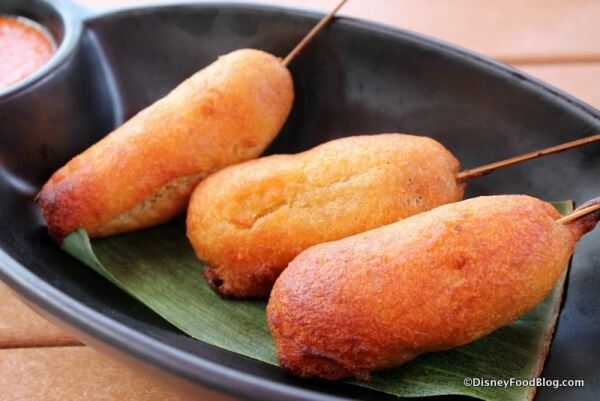 This dish ended up being the table favorite, being that we (my husband and I and my friend who met up with us) all like corn dogs. 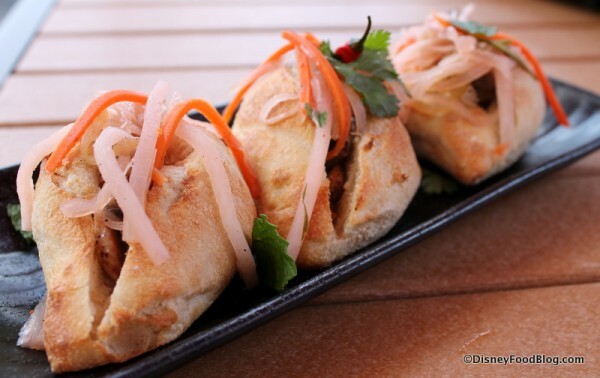 The Roasted Chicken and Pork Pate Banh Mi Sliders come in a batch of three as well. 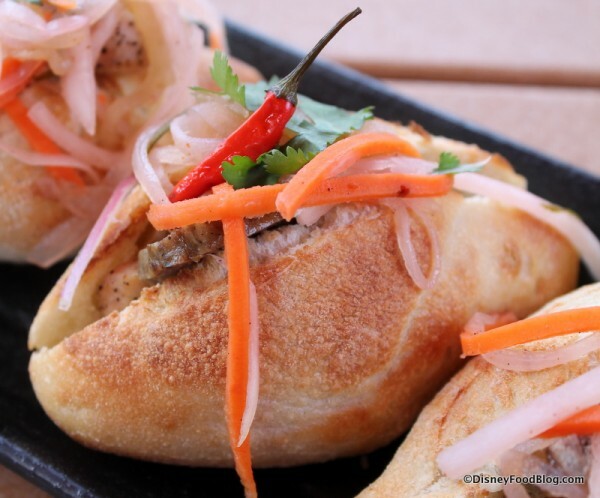 The crusty bread that surrounds the meat is a good bread, but there was so much of it compared to the filling that I found it to be overwhelming, with the end result that the sandwiches seemed rather bland, even with the addition of the flavorful pickled vegetables. Of everything we ate, this is the item I will pass on next time. 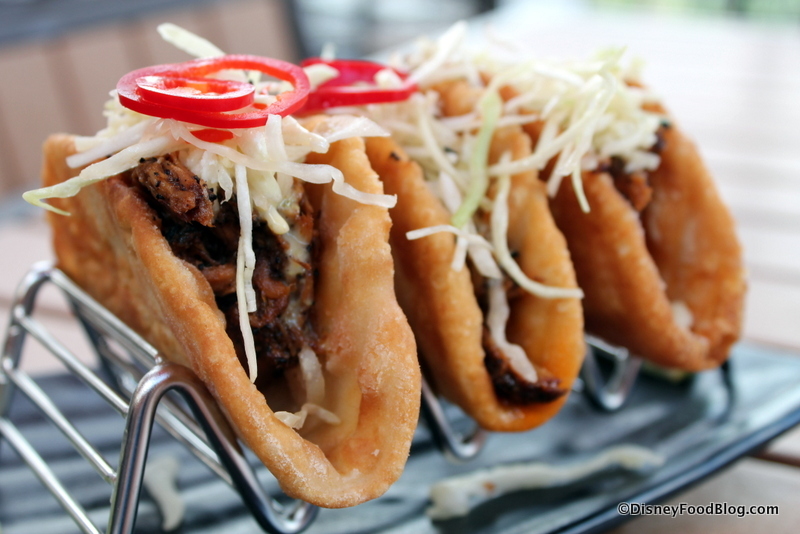 Finally, we tried the Kahlua Pork Tacos with cabbage and pickled vegetables. Unlike the sliders, where the breading seemed too much, the breaded shells instead stepped up the game for the Pork Tacos. Fried and crunchy on the outside yet still the slightest bit soft inside, they were a terrific addition to the pulled pork, which had a nice barbecue zest. The pickled vegetables here are just a basic slaw, fitting for this dish. And with that, we wrap up our time at the Tiki Terrace. 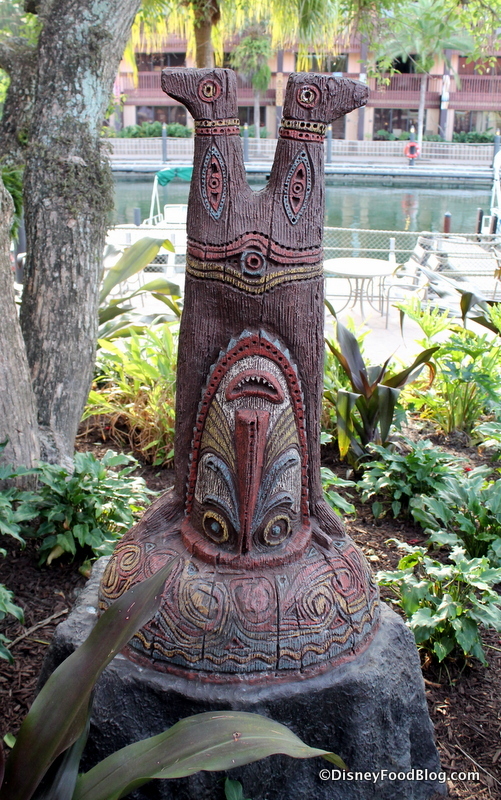 It’s funny, there have been a lot of changes at the Polynesian Resort since it’s refurbishment over the past several months. 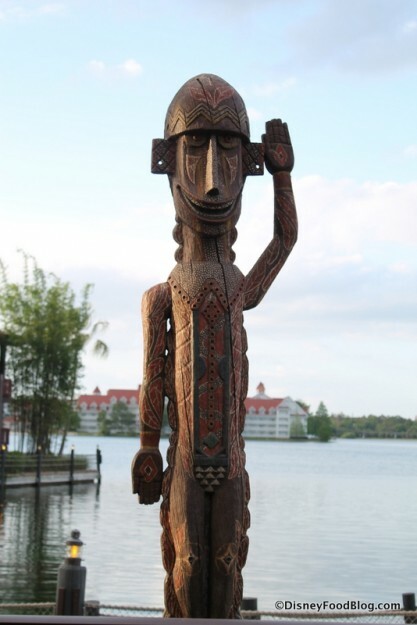 As a Disney fan who has long loved the Polynesian, I will admit that a few of the changes have been, for whatever reason, a little hard for me to get used to. There is something about the Tiki Terrace, though, that fits in so well that it feels like it’s been here all along. 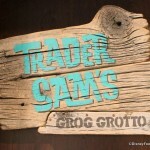 After all the anticipation for Trader Sam’s Grog Grotto, I think it’s living up to the hype, offering a unique, fun, and interactive experience that you’re likely to remember and talk about long after your visit. 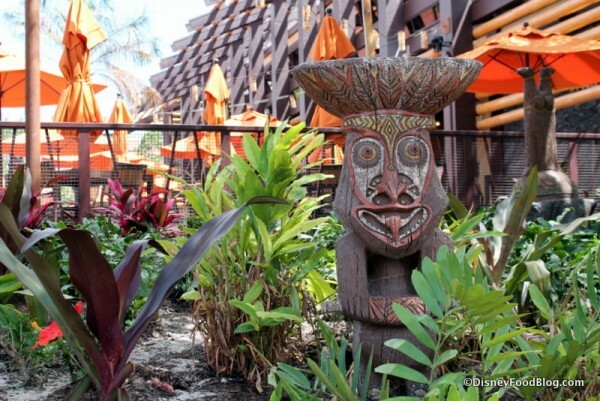 And while the anticipation surrounding the Tiki Terrace was understandably much less than the Grotto, I found that I enjoyed what it had to offer nearly as much with its own unique, laid-back style. 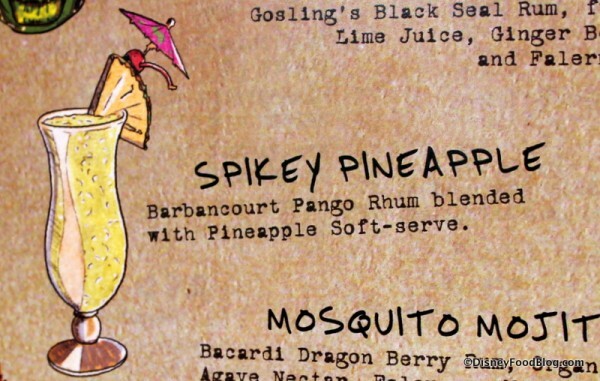 (Plus, you know… Spikey Pineapple!!). If you can make room for a trip to the Polynesian on your next Disney World vacation (and can handle the potential for wait times within your plans), I think you’ll walk away from Trader Sam’s Grog Grotto and the Tiki Terrace with some terrific memories. 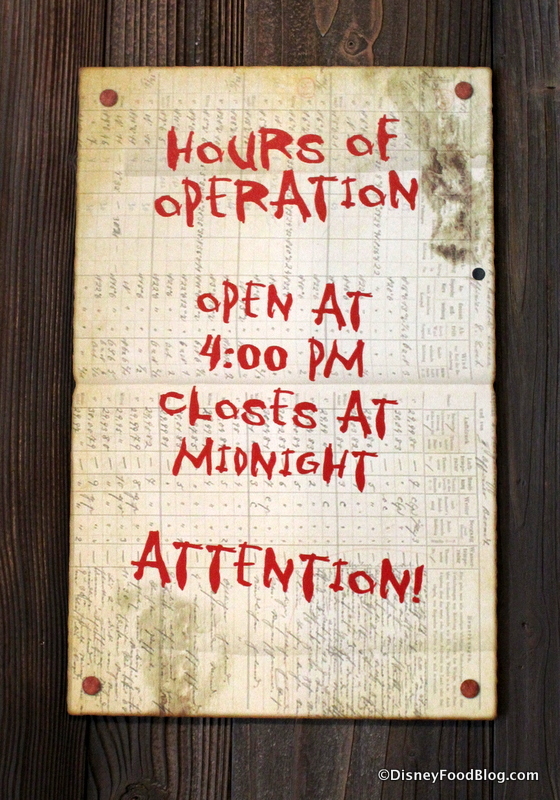 Just don’t walk away with one of Sam’s artifacts… unless you’re willing to trade two of his heads for one of yours. 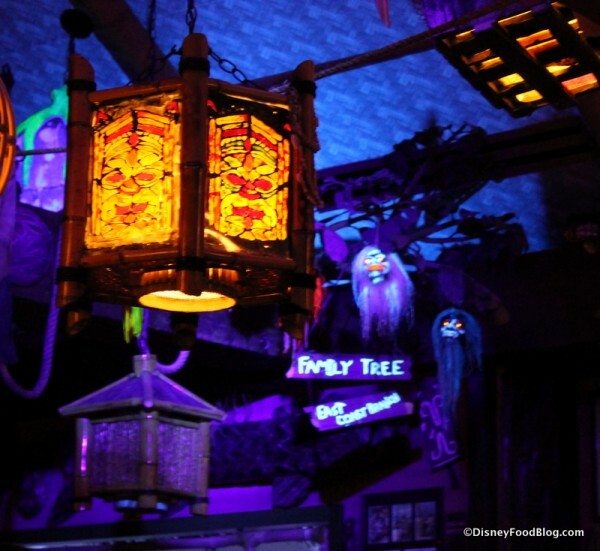 So here’s hoping you get a chance someday to visit Trader Sam’s! Skip and the gang are waiting for you! 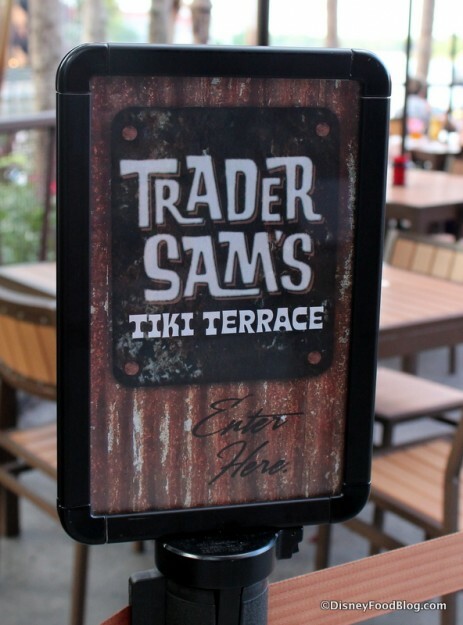 Are you hoping to visit Trader Sam’s on your next Disney World vacation? Please let us know with a comment! 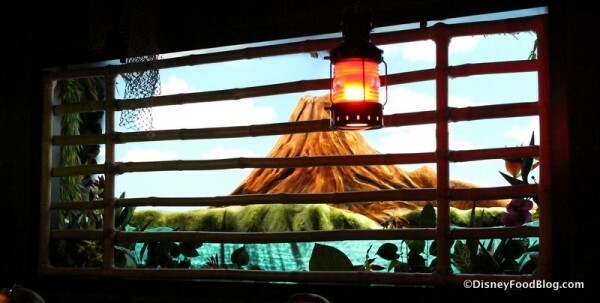 Looks like a great place and a fun stop for a drink, but I wish there were some vegetarian options on the snack menu. Even some mixed nuts or edamame would be nice. The menu does not do anything for me. Maybe those chicken wings from Kona’s would be nice. Hopefully they change it up a bit soon. Just bring on the Orig. 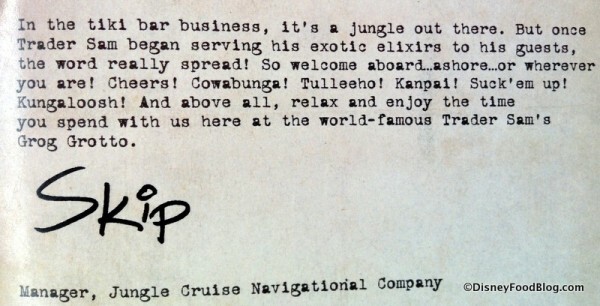 Kungaloosh and the Jungle Juice That would really make me happy!!! So Sam’s is inside but you wait outside on the bench? I’m excited to check it out! 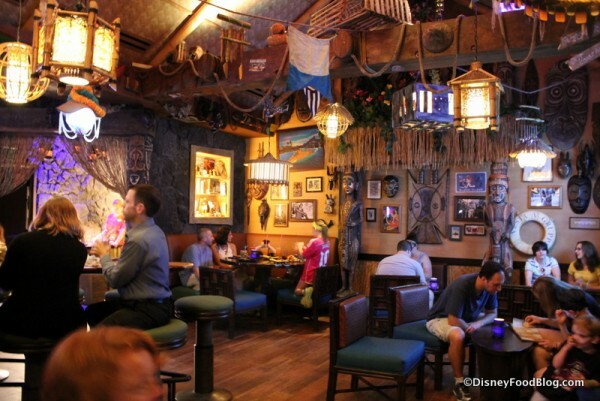 I haven’t been in the Poly much so here’s a question – how far is it from Captain Cook’s? 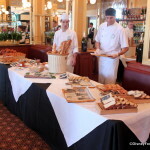 We want to grab dinner there and then have a drink after, but if there’s going to be a wait I’d like to get a pager first but don’t want to be out of range of the pager either. Great review! Looks really exciting. 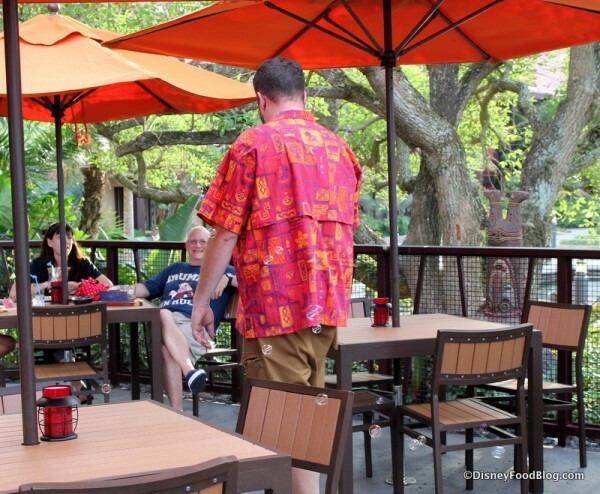 Is it ok just to grab drinks outside on the Tiki Terrace or is if more for those who want to eat? We probably won’t get food and I’m worried about finding a space in the Grotto so the extra tables outside would be a great second option. 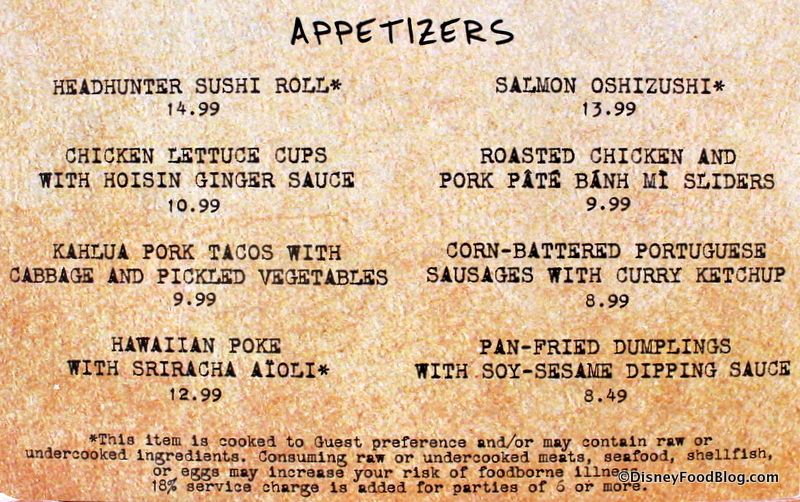 It’s a pet peeve of mine when bars/restaurants don’t print prices on the menu – just rubs me the wrong way. Can’t wait to try it out! Just booked a Poly bungalow for November, so excited!! Thanks for the report. I have a similar question to Kirsty’s, can you just go to the terrace for drinks and food without waiting to go into Sams Grotto? 90 minutes to 2 hours? 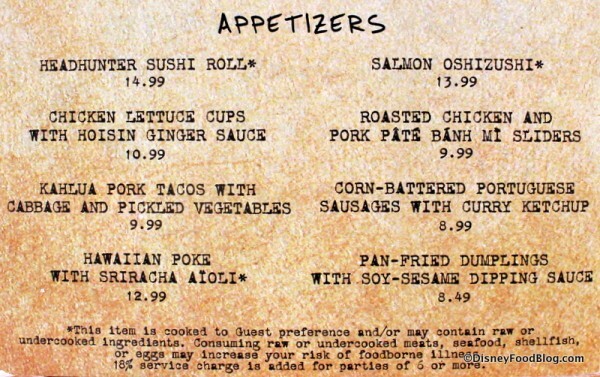 The plan is to go, get my pager, then have dinner at Kona. By the time I’m done my seating should be ready at the Grotto. Maureen, I have a feeling that the lack of prices on the menu is due to the fact that Trader Sam’s is still in the soft-opening stage. 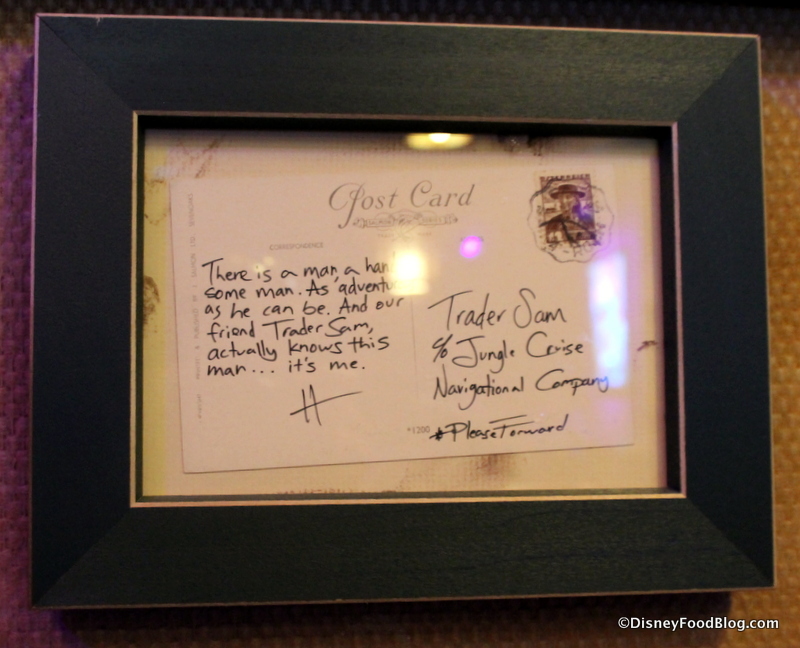 Hopefully when it is officially open they’ll have all the prices listed, along with some menu changes. 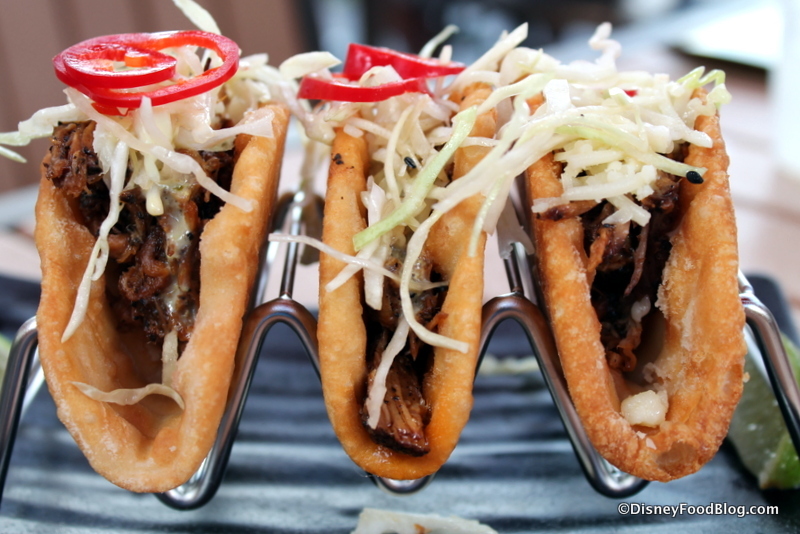 I’d really like to see those sliders get replaced with something a little more yummy sounding! 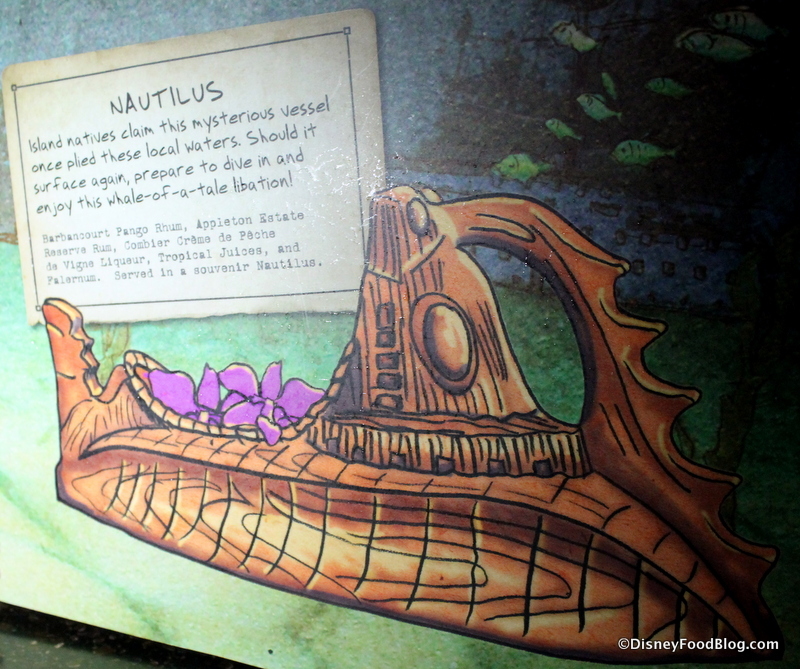 Becky — It’s not far at all from Capt Cook’s :). 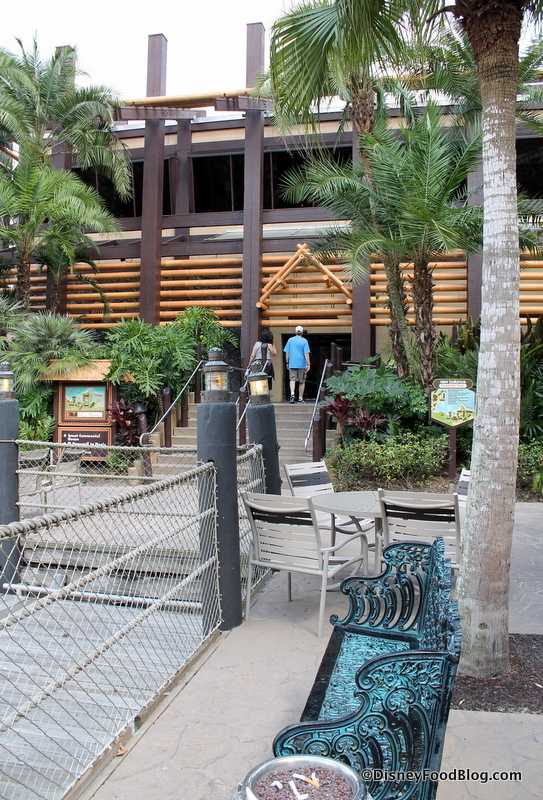 They’re in the same general area (facing Capt Cook’s from the lobby, the Grog Grotto is just a left turn down the hall). I’d recommend checking with a Cast Member when you get your pager to be sure, but I think it might work in Capt Cook’s. 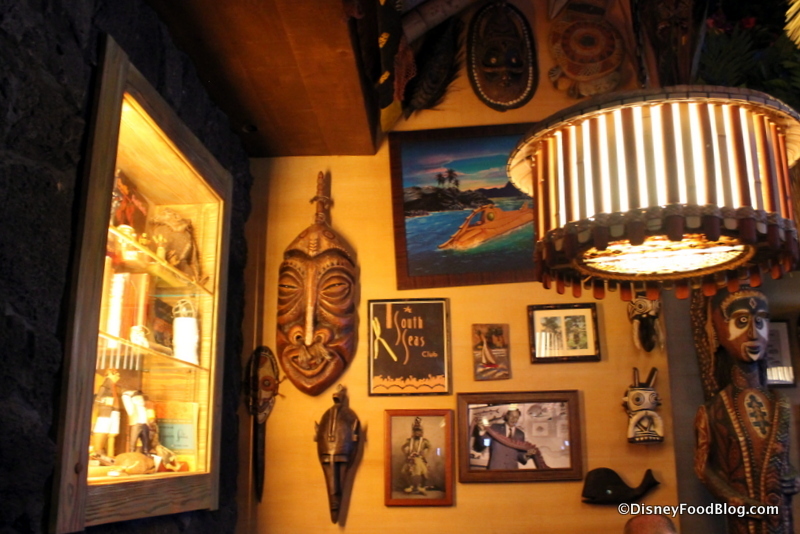 I was told the pagers work about midway through the lobby, and Capt Cook’s is closer to Trader Sam’s than the lobby. Hope that helps! Kirsty — Hi! Yep, having just drinks is totally fine. 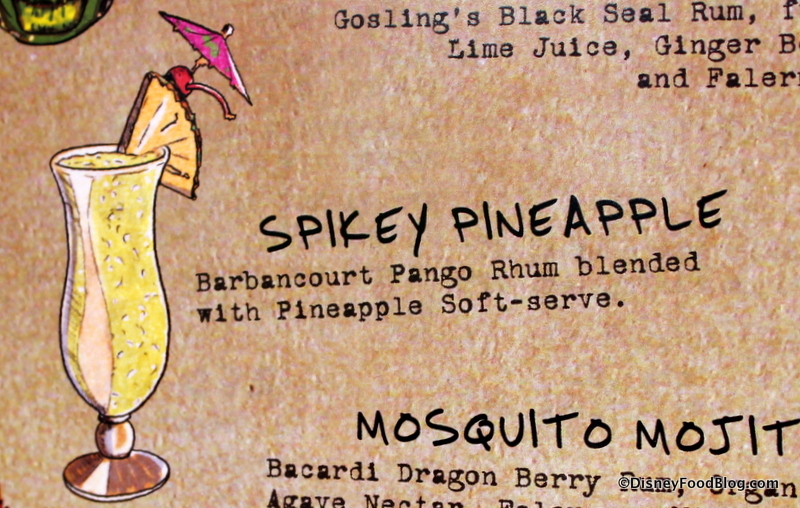 I plan to go back to the Tiki Terrace every once in a while for the sole purpose of getting a Spikey Pineapple ;). Enjoy! Julie — Thanks for the question! I’m sorry I didn’t explain that better — we happened to visit both on the night of our visit to check them both out, but guests are more than welcome to visit just one or the other. 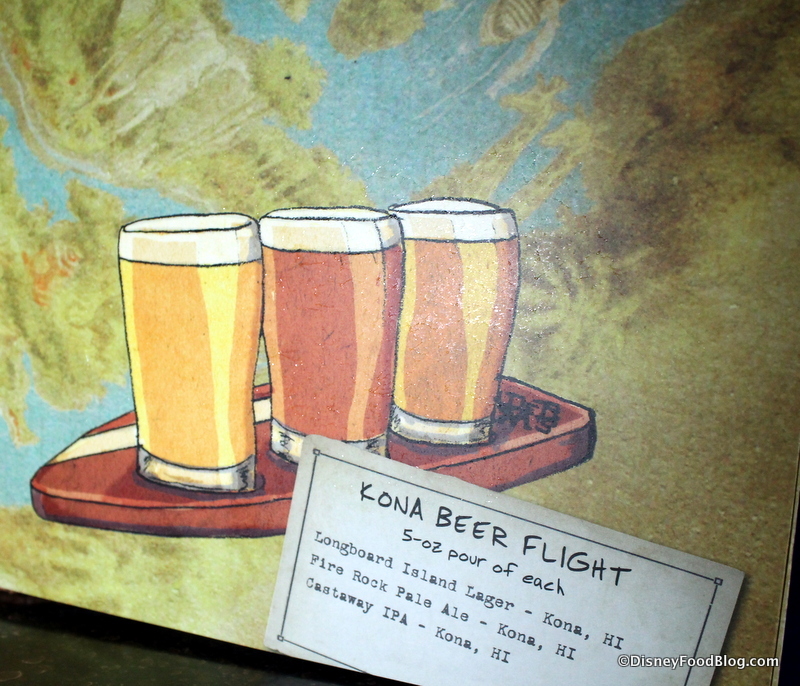 How much are the Kona flights? 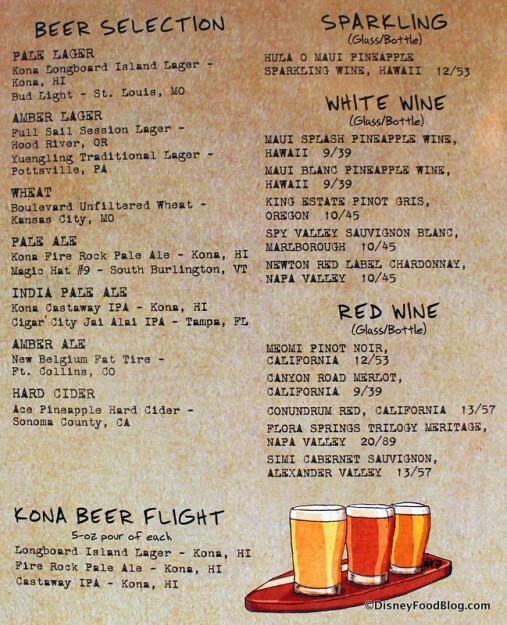 I already love Kona’s brews, though my favorite isn’t on the flight (Big Wave golden ale) but one I haven’t tried is (Fire Rock pale ale). So I’d love to get it — and get those glasses! We’re coming on Saturday & one of our plans is to try as many new beers as possible, especially from the Florida breweries. 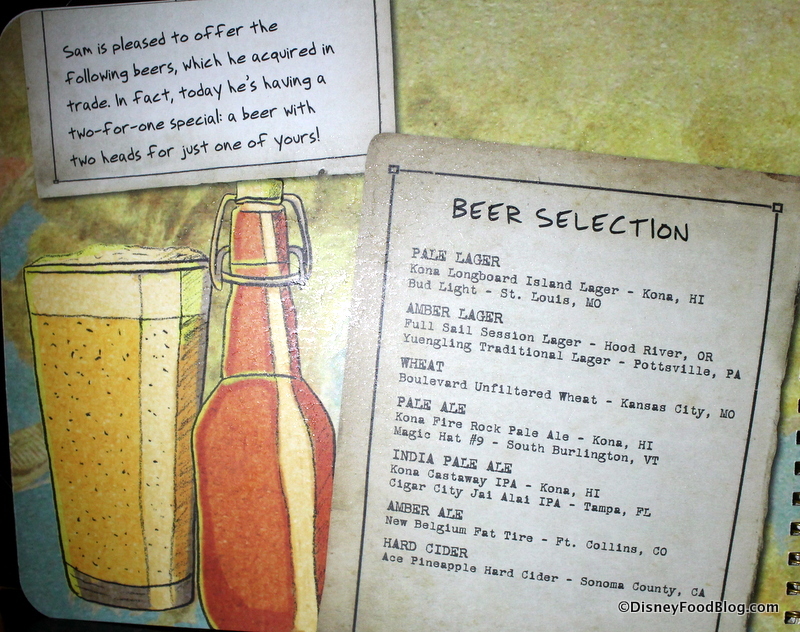 If your husband is a craft beer lover and wants to recommend some, we’d love it! 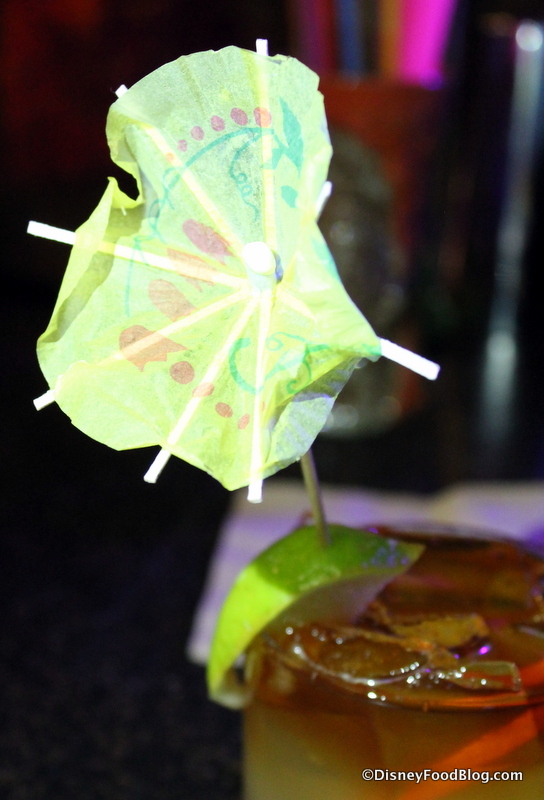 You mentioned the Grog is open til midnight (21+ after 8). 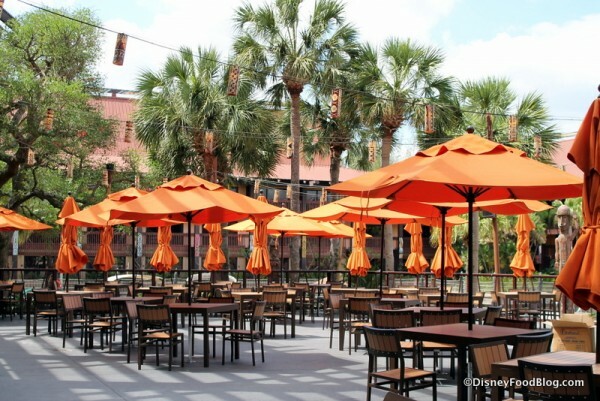 Are there similar hours/restrictions for the Terrace? And do you know if food is served until midnight? Thanks for the great review and pics. Can’t wait to visit next month (we’re locals and waiting for the buzz to taper off a bit). Thanks for the review! Even though I was there twice I learned more about the drinks, food, and artifacts by reading your review. At our first visit 2nd day of soft opening, hotel staff did not know the line was outside. Found out after hanging out in Lobby for an hour, and ended up being a short wait. When we were there the beeper gets you in the bar but you need to find your own seat (at bar or cocktail table etc). So if you have a party of 5 you will get in but doesn’t mean there is a table for 5 waiting for you. Since its a bar it’s fine, just think it can be important to some. Did not seem like the atmosphere for kids for those wondering (in my opinion). If you have a wait grab your beeper and head to the outside lounge and grab a drink. Hi! 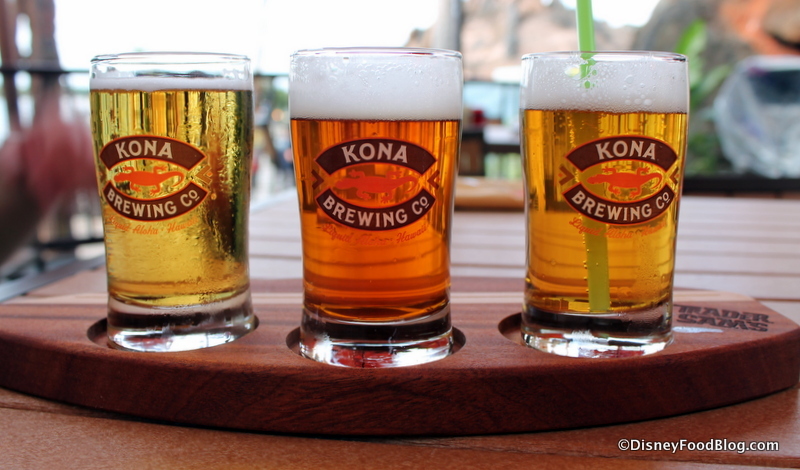 I was just wondering, for drinks that come in souvenir glasses, do you have to buy the glass as well? Or can you get just the drink? Thanks! 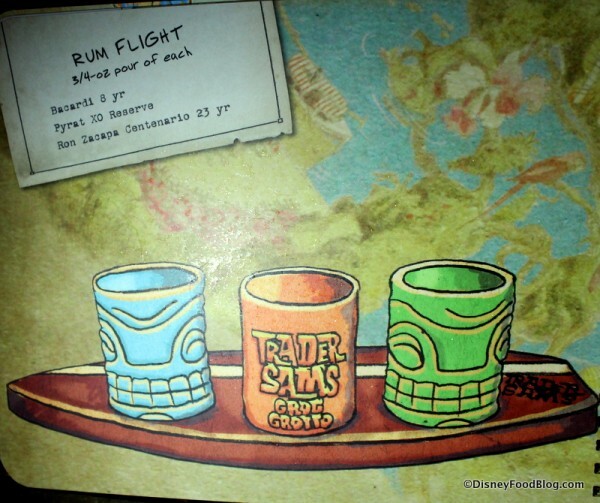 Are the rum flight glasses available as souvenirs? I understand Sam wants to keep his surfboard. 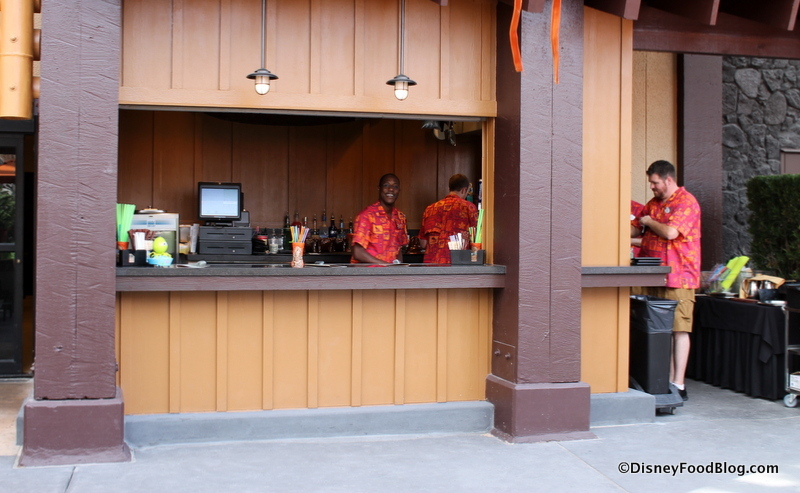 I didn’t see prices anywhere for most of those drinks. Particularly interested in price for Krakatoa Punch in souvenir tiki mug. Thank you for such a wonderful article on Trader Sams and the Tiki Terrace. I miss it even more now though !!!! 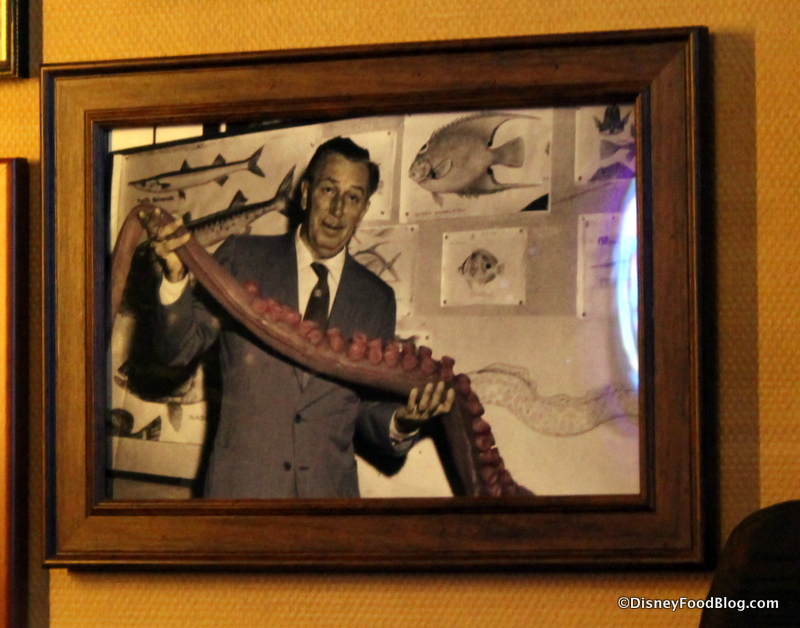 We visited in late April, my favourite drink was the Nautilus (we sampled a few)…a great time and a memorable evening at the Poly. I was wondering if the wait times are still significant now that Trader Sam’s has been open a few months? We would probably visit later in the evening, not right at 4 PM. Is it impossible to get a table? Thanks! Jenni — I was just there earlier this month and had about a 45 minute wait time at 7PM on a Saturday. Hope that helps! Does anyone know if you can take a drink to go? 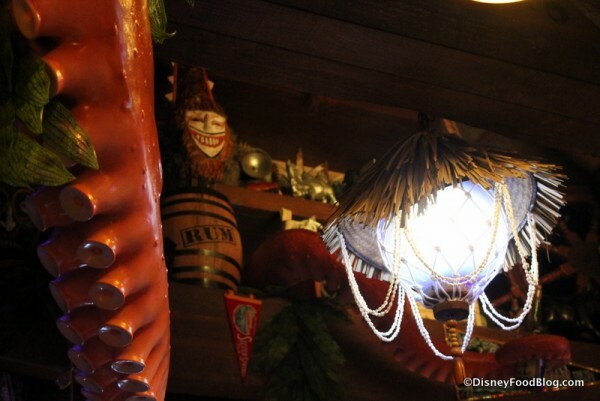 I’d love to grab a drink and then head out to the beach to catch the movie and Wishes. 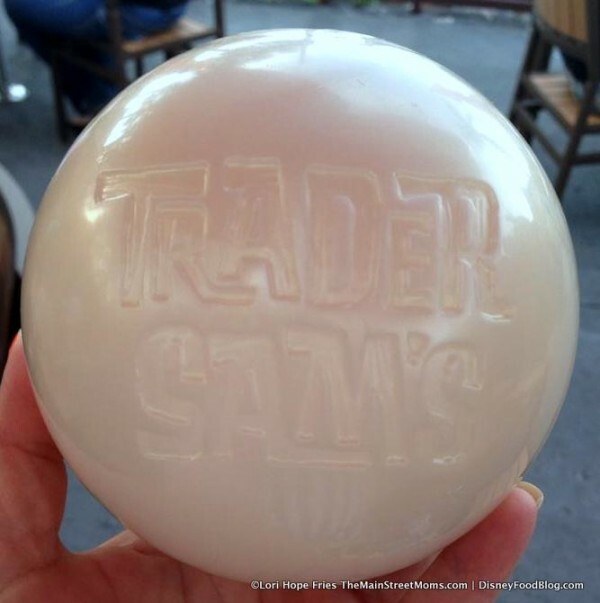 Can you get the souvenir cup without the alcoholic drink? Or just with some water or soda? I took my 7 year old granddaughter there in Dec for About 45 mins she enjoyed it but after awhile you see the same thing over and over, so I would bring the kids early for a quick drink and the Gorila Grog for the kido’s and go. Great review! 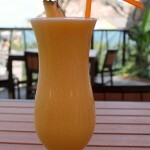 I’m going tomorrow and it was recommended I check this out and have my drink on the beach and watch Wishes? Where is this beach! ?